Kajitsu serves exquisite vegan Japanese food in the Buddhist fashion; it's good and interesting enough that you probably won't miss the meat - I didn't. Kajitsu, the name of the discreet subterranean Japanese restaurant in Manhattan’s Lower East Side, means ‘a fine day’, which is something you can be assured of having should your diurnal cycle happen to conclude within its enlightening confines. Upon entering, don’t let chef Nishihara’s youthful glow fool you. He spent over 12 years learning the intricate art of kaiseki cuisine; 10 in Kyoto and two in Nagano, where he specialised in producing the multicourse affairs of hand-made buckwheat soba noodles. He brought all of this experience with him to New York two years ago and, for some unknown reason, no one really seems to have noticed. That is, if you ignore Messieurs Michelin, who promoted the restaurant to two stars in last year’s guide. Kajitsu serves shojin ryori cuisine, a purely vegetarian form of gastronomy that was popularised in the 13th century by Chinese Zen monks in Japan, and is still served in Zen temples today. And, if these monks’ food is anything like what I recently sampled, no wonder they always seem so happy. 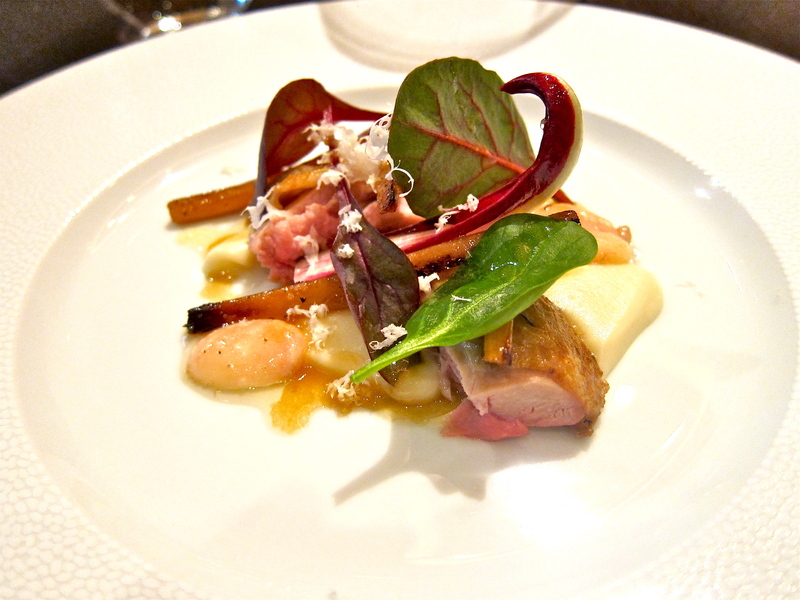 The meal was a fascinating vacillation between the paring down and joining together of exquisite ingredients. Our opening course set the tone for what was to come. The most delicately fried cubes of Trumpet Royale mushrooms had been wedded to fresh persimmons and pine nut cream. The green and golden pyramid was presented insideindividual clay dishes which resembled blossoming flowers. The ingredients bled umami on the palate (luckily not the plate), with the sweet and tangy persimmon ably dabbing up the spillage. So immersed was I in this dish that I was taken aback when a fellow diner at the other end of the chef’s counter snuck up behind me and tapped me on the shoulder. 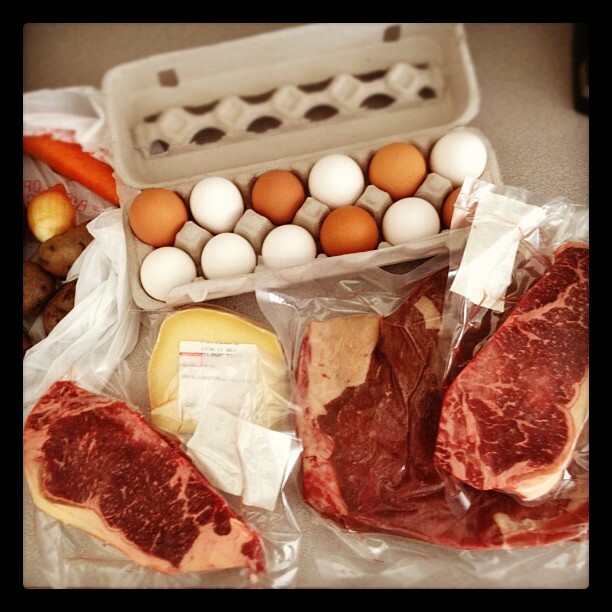 “I also photograph my food,” he offered. I felt like telling him, “That’s probably not something you want to gloat about to a stranger – even if he also has the peculiar habit of recording every potentially memorable bite he consumes – especially now that you’ve got the chef’s attention, numbskull.” Rudely ignoring my internal rant, he continued, “I was so eager to taste this course that I forgot to take a picture of it before I dug in. So I was wondering if, um, I could take a picture of yours.” My dining partner and I couldn’t help but smile, and let him complete his simultaneously innocuous and brave task before shuffling back to his stool to show off the stolen image to his other half. The next course, a seemingly simple carnelian yellow and “scarlet-tinged” minestrone soup consisting of kabocha squash, bell peppers (which I normally hate – and yes, hate is a strong word), yellow yuzu and the mild but flavorful shichimi togarashi (seven spice), maintained my interest throughout, with citrus and chili notes peppering my tongue while I enjoyed the savory yet ever-so-sweet sweet broth. And so it went: complex followed by ‘simple’. 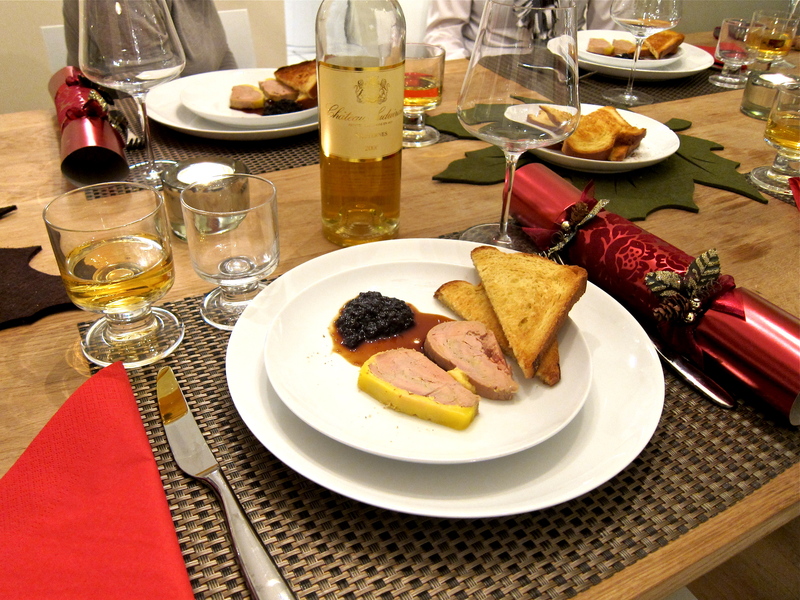 Our third course was fittingly composed of three separate dishes, each more elaborate than the last. Let’s just say it involved wheat gluten which had been fashioned to resemble yellow maple leaves with orange edging; three rice cigars wrapped with tofu skin, crowned with beads of ‘land caviar’ (cypress seeds) and complemented by the best ginger I’ve ever tasted, and an immaculate pile of braised enoki mushrooms with nori, daikon and a radish wedge that provided a peacock-worthy splash of color. This was followed by soba noodles with dipping sauce. While this is a dish you can order in any number of Japanese restaurants, the noodles won’t likely be made in-house and certainly won’t taste or feel like this – the texture was springy and superb – and the unusual addition of fresh wasabi was a welcome one. The main course was certainly the triumph of the evening, both in visual affect and deliciousness. 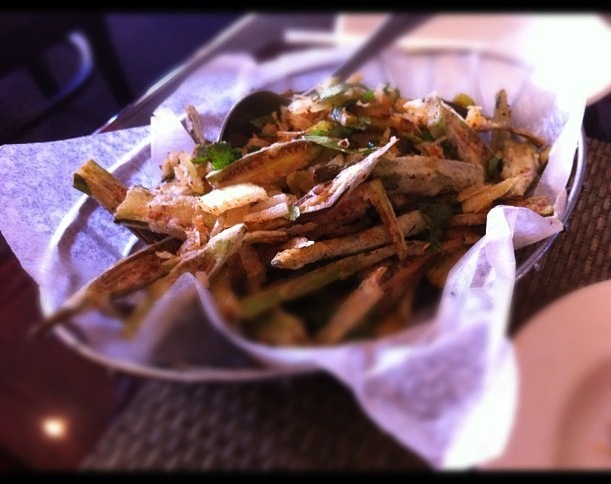 An assembly of vegetables – some raw, some steamed, some fried; some warm, some cold, some neither – resembled autumn leaves that had been raked together into a pile similar to those you see at the end of proud homeowners’ driveways. 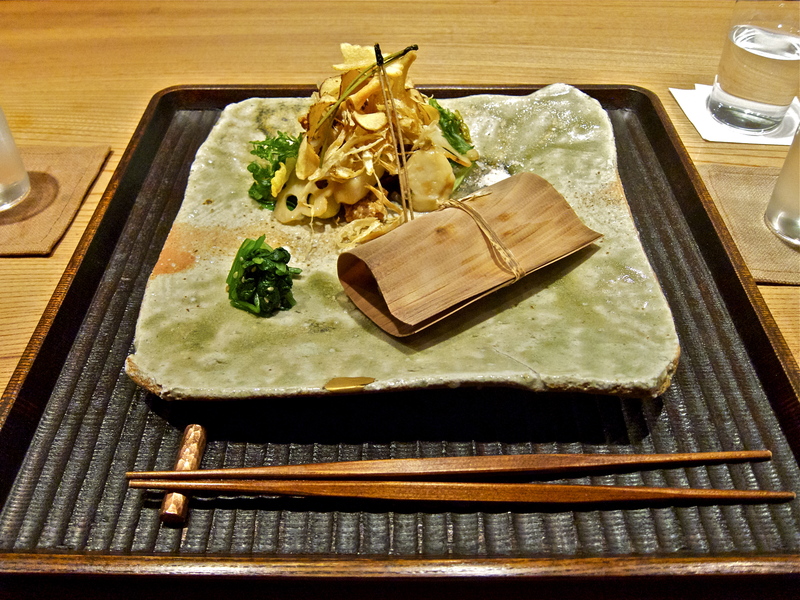 The foliage was sprinkled with edible ‘pine needles’, which were actually brittle green tea noodles. 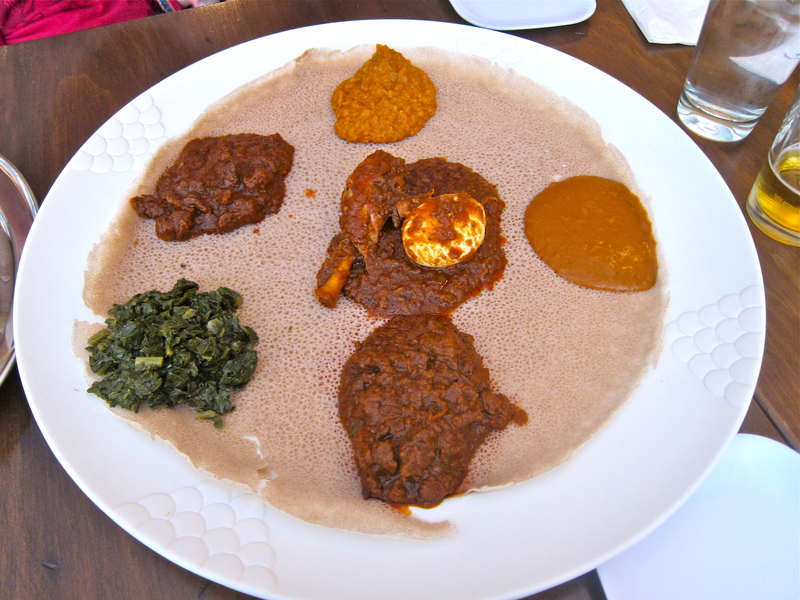 This was both substantial and without a doubt one of the tastiest dishes I’ve eaten in some time, endlessly dazzling in its variety of textures and tastes, with no dud notes to speak of. Lying next to the leaves was a wooden wrapper, beneath which lay a row of cedar-smoked, green wheat gluten and portabella mushrooms that was surrounded by soft walnuts and a sticky combination of red miso paste and salsify. This was also surprisingly, and quietly, good. A straight-forward bowl of steamed rice dotted with chestnuts was pleasant enough, but it was the trio of pickles residing next to it that made a good case for being a dish on its own. Desserts continued down the same path, each containing only a few ingredients that were perfectly confident spending time with themselves. A diminutive mochi pancake with dates and sweet azuki bean paste was branded with the logo of the restaurant – a circle/square/triangle image descended from an ancient Buddhist story in which the master tells the student that once he realises the meaning of these three shapes he will truly be wise. I am, alas, still pondering. Soft and delicate, the pancake led us to our final unassuming course of rice cracker candy and green tea. The chef whisked the matcha right in front of us and, while there was not much liquid in the bowl, it packed a punch. The surprise of the meal was learning just how good a sweet rice cracker could be – it was out of this world (well, definitely from out of this country), and perfectly offset the intensity of the frothy green tea. The meal hadn’t actually lasted that long, and my companion and I lingered for another hour or so talking about relationships and food. At one point, the chef came up to us and smiled as he presented us with an extra nibble: a mini sweet potato ice cream ‘hamburger’ with a single walnut topping. This was subtly divine, and I was glad that the crunch of the light rice cracker ‘bun’ – coupled with the flavour of cool, sweet yams – was my final bite of the evening. As I left, I felt completely content and not the least bit bloated. Despite a successful pairing of five sakes, I also felt remarkably lucid. 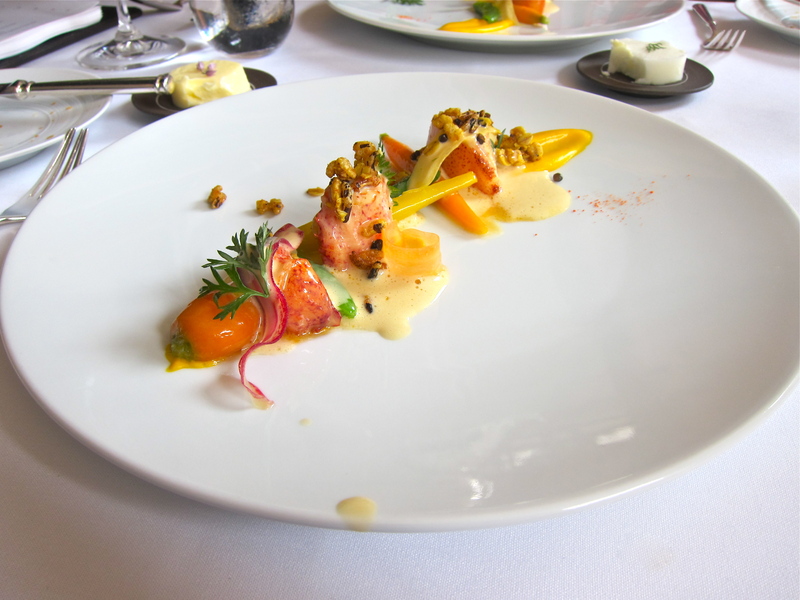 The meal was something of a revelation as, without basic kitchen foundations such as dairy butter (the food is suitable for vegans), chef Nishihara was able to create a delightful meal that never seemed wanting in any regard. In fact, his food resembles the enigma of traditional Japanese culture I experienced when I visited the country some years ago: it has been developed over a long period of time; it is undeniably beautiful and painstakingly considered, and it has a sea of emotions bundled up at its core. You may or may not experience the emotions, depending on your state of mind at the time, but they are worth discovering. Given that the seasonal menu changes with the months, there is much still to be unearthed from this serene and (still) hidden goldmine. 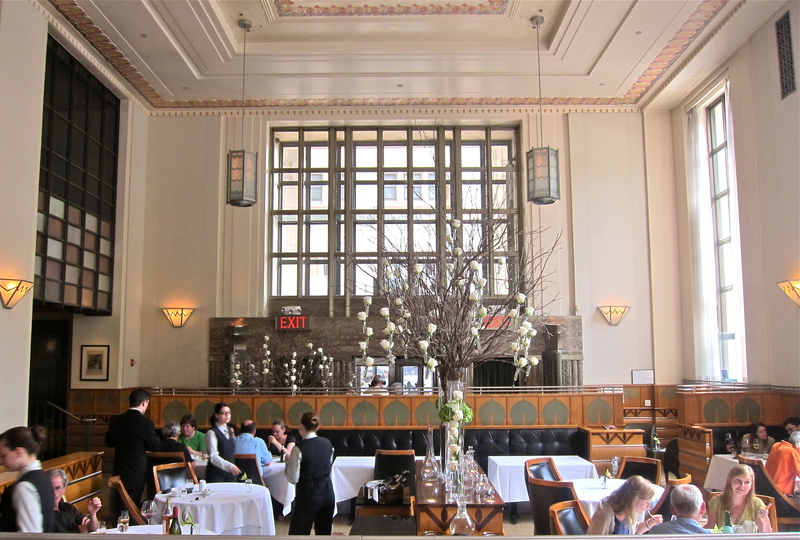 I first visited Eleven Madison Park last summer for dinner. 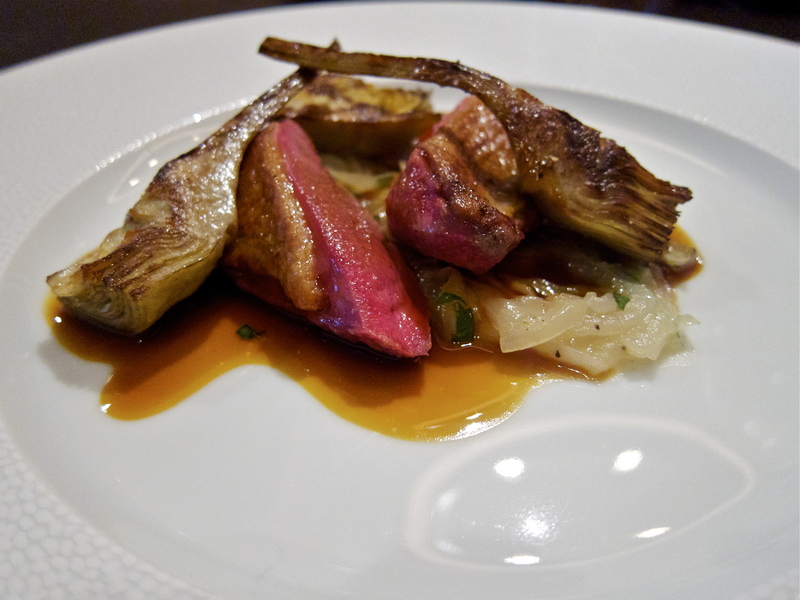 I was very excited about the restaurant as many critics and bloggers seemed to agree that its Swiss chef Daniel Humm and his team had really begun to hit their stride. 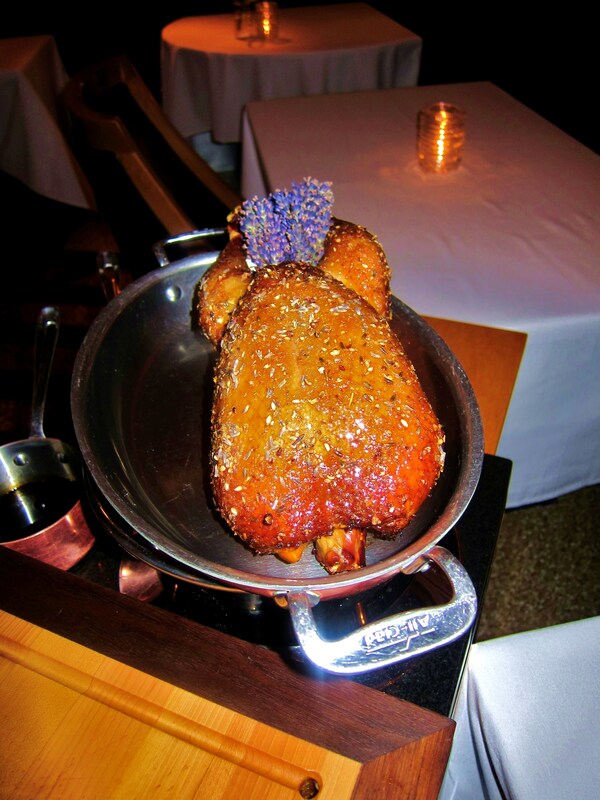 We had a very pleasant dinner, but only a few things remain engrained in my mind over a year later: the unbelievable roast duck with lavender glazing that was presented whole and then carved up by the side of our table, and the uncanny knack of the front of house staff to anticipate our every need and desire in a casual and subtle fashion. Everything else is a little bit blurry, no doubt in part due to some of the excellent wine that we consumed that night. Earlier this summer, I had the opportunity to return for a rare leisurely weekday lunch with a friend of mine who was visiting from overseas. We were both curious to see how this New York Times 4-star and Michelin 1-star restaurant (not to mention #24 on the most recent World’s 50 Best list) would live up to our expectations, and I was personally curious to hear my friend’s own views given his considerable culinary background and talent. 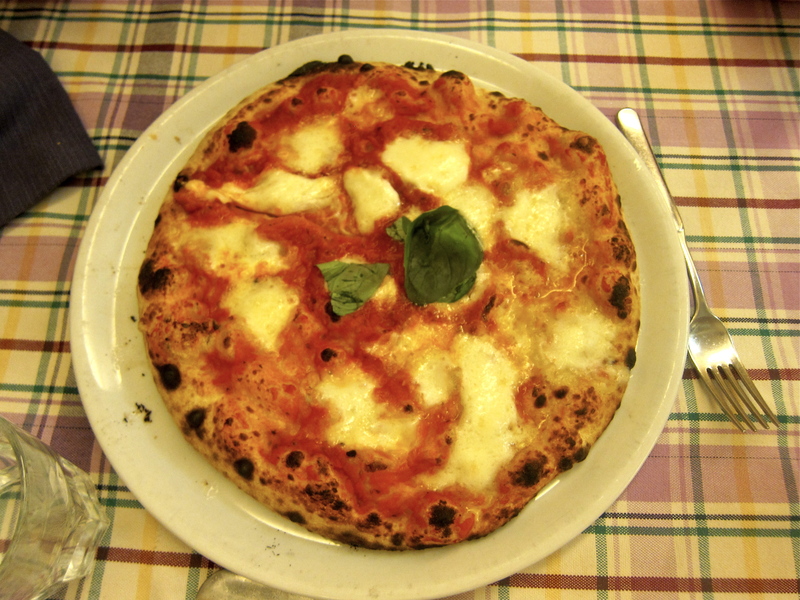 At my first meal, there had been a traditional structure to the menu, but this changed in September of 2010. Now, for every course, the diner chooses the main ingredient for each dish, and the kitchen then constructs a dish around the selected core element, taking into account the diner’s personal preferences and/or any allergies. I never asked, but would be curious to know how this works logistically in the kitchen as they presumably only have so many iterations or frameworks for each ingredient thought out, tried and tested ahead of time for each star ingredient. 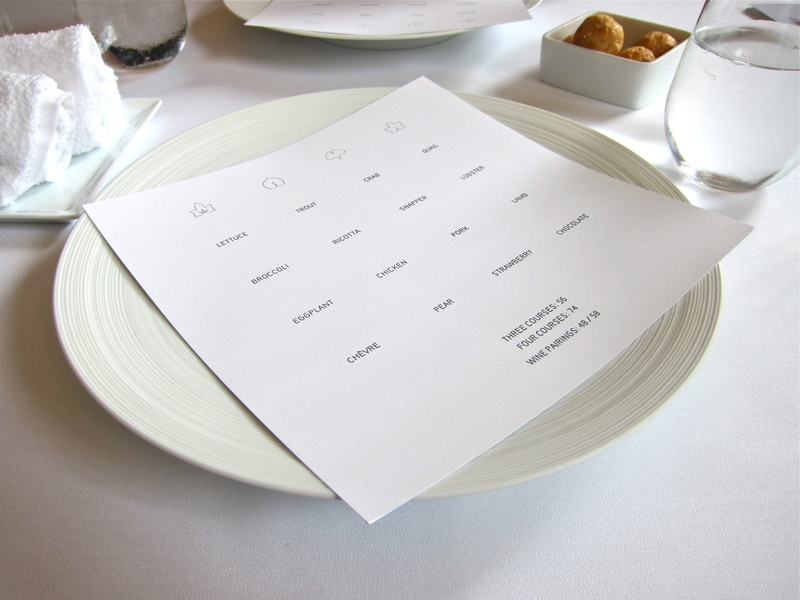 Although four courses (plus all of the extras) would probably have been more than sufficient, we opted to go for an unadvertised tasting menu (well, it is mentioned on their website, but it wasn’t visible on our lunch menu). In the end, this turned out to be a mistake as it didn’t equate to good value for money given that we spent nearly 70% more for what amounted to be only two extra courses. I will try to keep my commentary to a minimum and let the pictures speak for themselves (as you may notice, I’ve also made the pictures larger than in prior reviews – let me know if you prefer this). 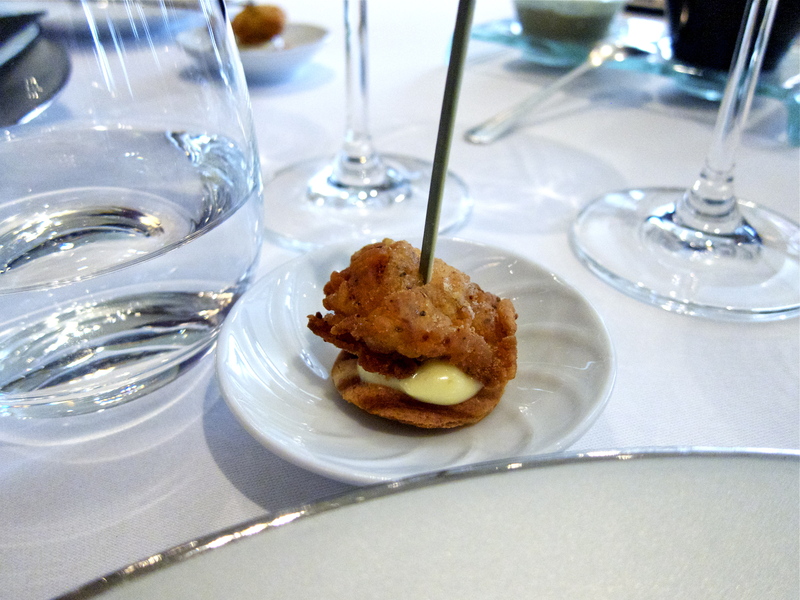 It is suffice to say that the opening progression of small bites and dishes was fun, well-balanced and impressive. 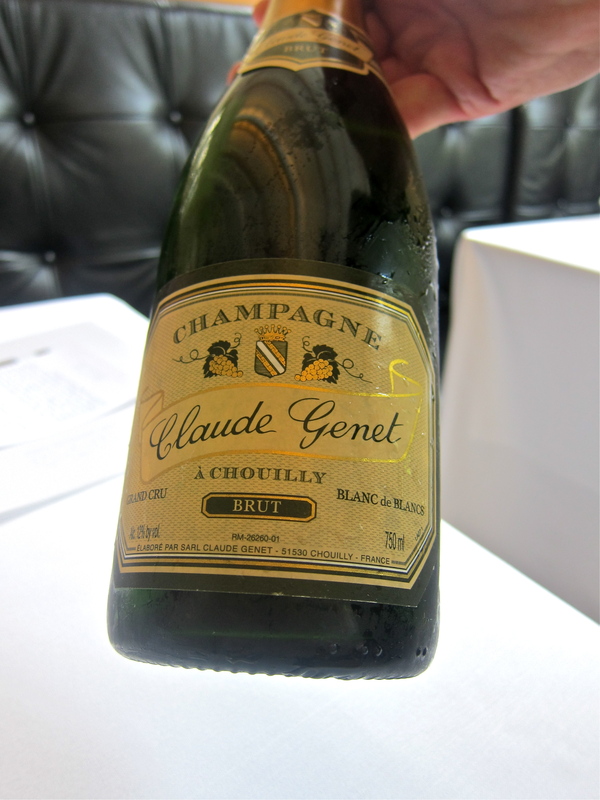 I remembered that I had been quite taken with the Champagne I sampled on my prior visit, and luckily they still had it on menu by the glass. The delicate grower-produced blanc de blancs (meaning from Chardonnay grapes only) Champagne was perfect with the meal’s preamble. 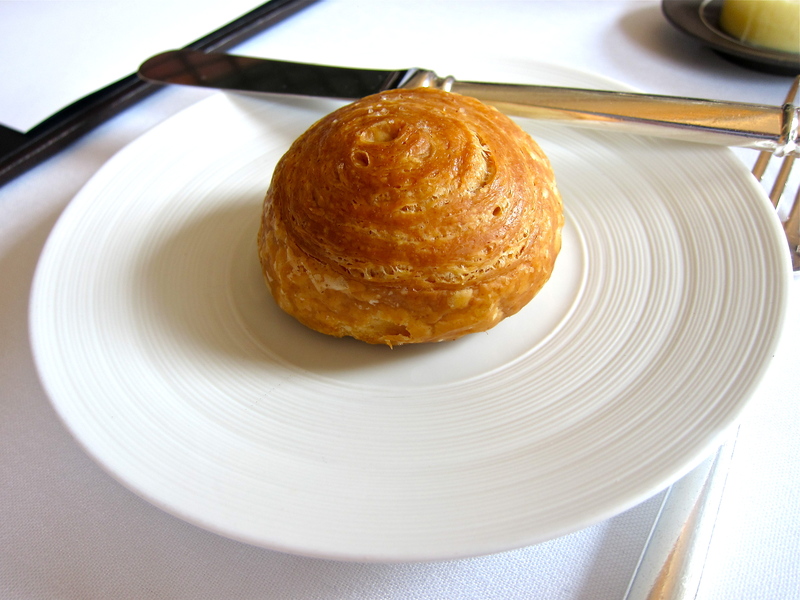 The golden, plump gougères were made from an excellent choux pastry and had just the right amount of cheese so as to be present and pleasant, without overshadowing the light dough. 8/10. 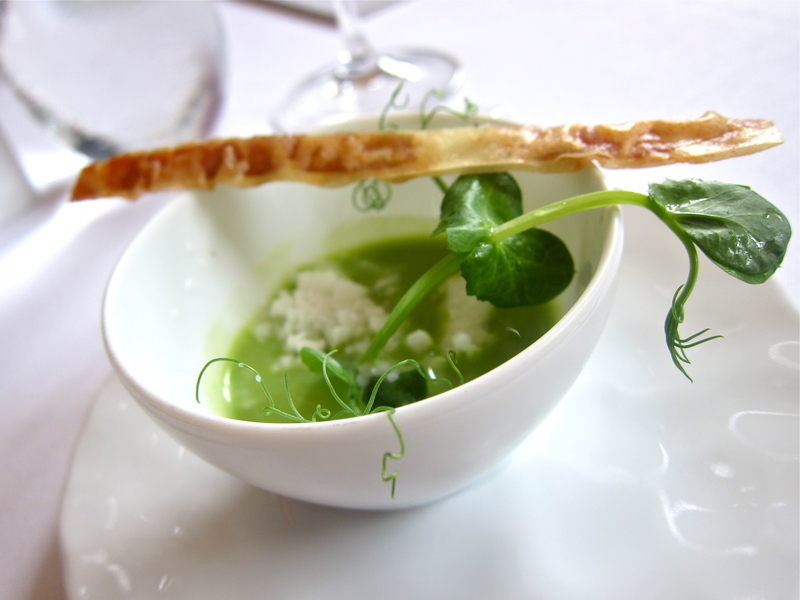 A chilled, sweet pea soup was accented by some even cooler milky ‘snow’, with a crispy ham cracker lending crunch and saltiness. The combination worked well and was also artfully presented. 7/10. 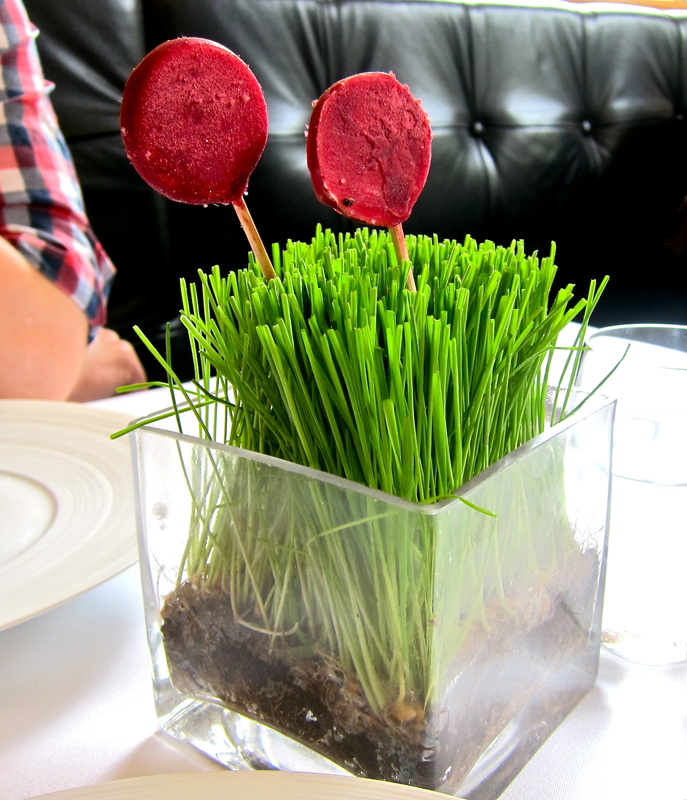 Besides being colorful and playful, the goat cheese lollipops were also downright delectable. The beet coating not only added vivacity to the presentation but also lent a subtle flavor which melded well with the cheese. 8/10. 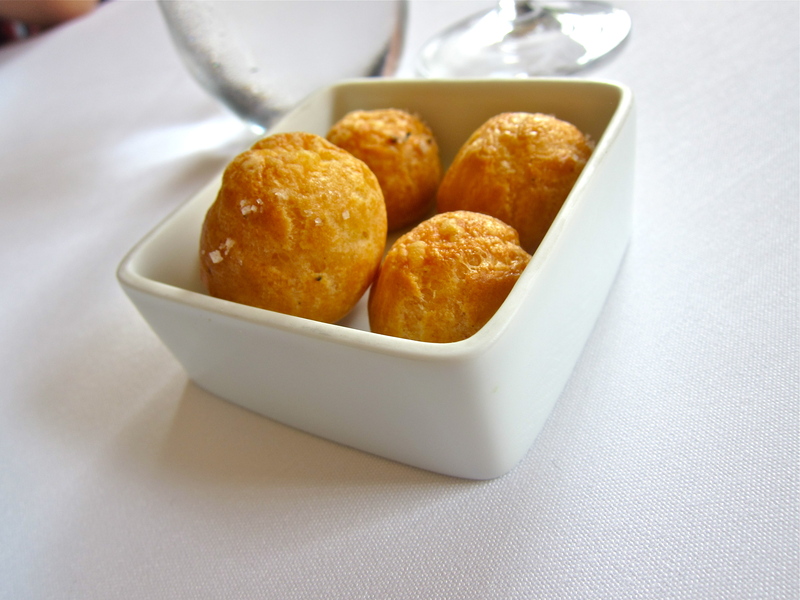 These little blonde spheres of (fried) bread and (goat) cheese were also delicious, with the rich flavor and saltiness of the cheese being offset by the watercress in the light emerald dipping sauce. 7/10. 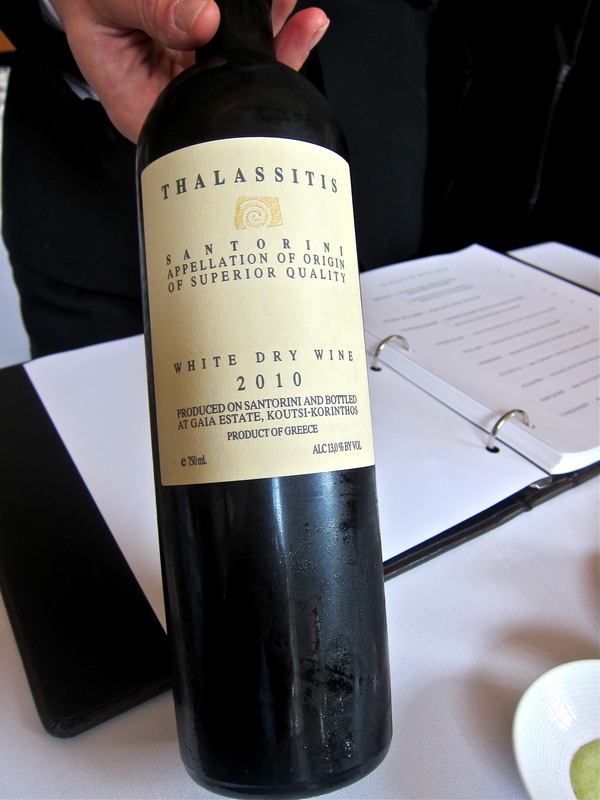 We had run out of Champagne and the sommelier recommended this Greek wine to see us through a few more courses. It went fairly well when sipped with the next mini-course. 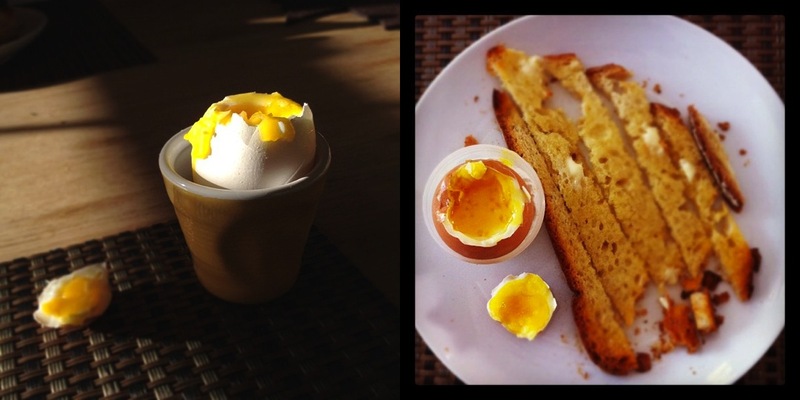 The saboyon was heaven in a hollowed out eggshell: luxuriously smooth, smoky, creamy, with a touch of acidity and perfectly seasoned. I wanted three more three-quarter filled eggshells full of it. 10/10. Two types of butter were served for the meal, one from a cow (left) and one from a goat (right) – both elegantly presented and quite delicious. 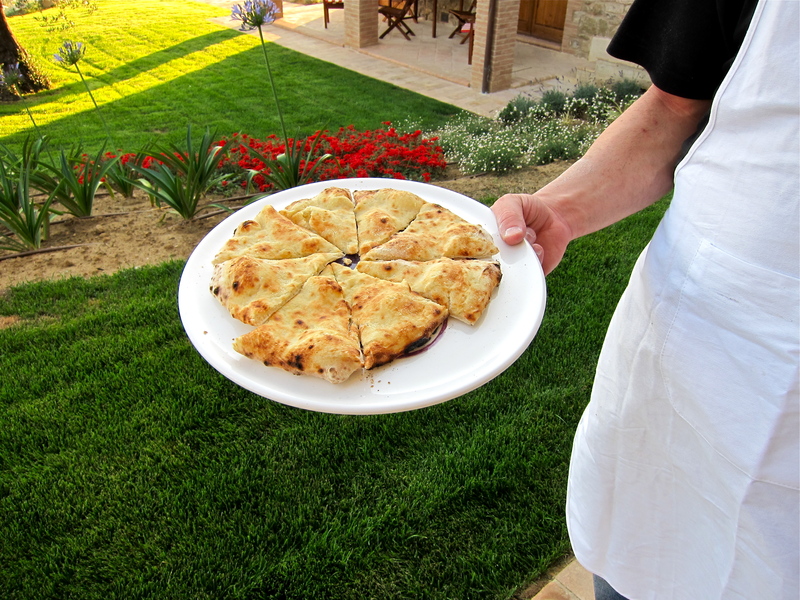 The bread was freshly baked and of very high quality, with a lovely crispy crust. 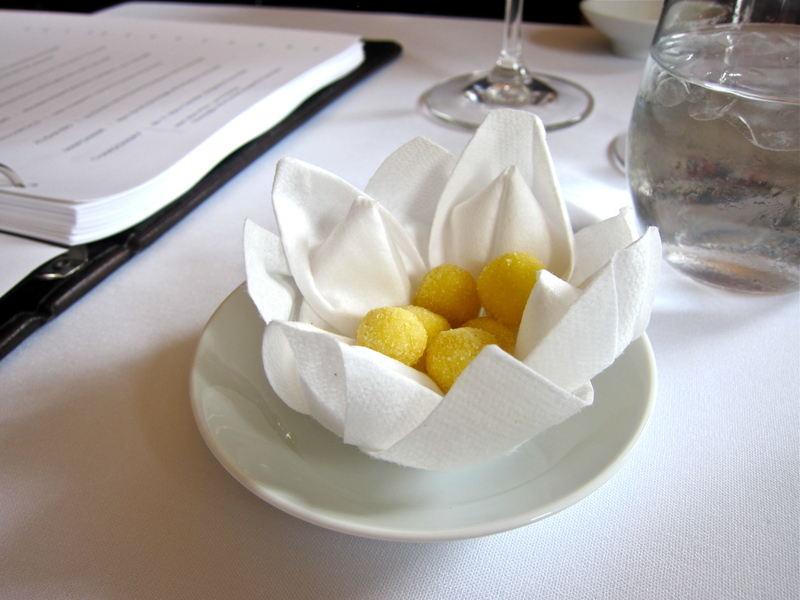 The presentation – they arrived in a little taupe-tinged blanket – reminded me of the way the ‘snacks’ are served at noma. 7/10 (I wish there had been a variety of breads offered). 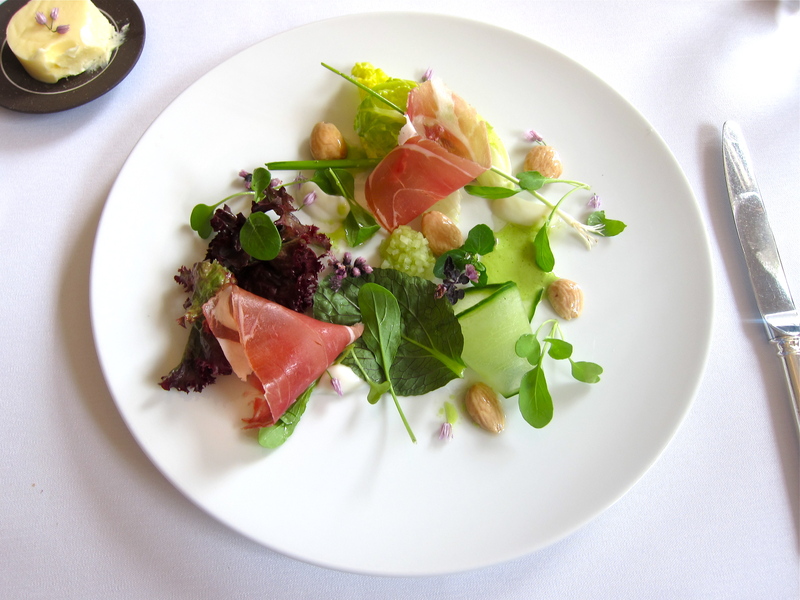 The first of the ‘real’ courses was a wide assortment of lettuce seemingly randomly arranged and interspersed with two slices of excellent ham, moist almonds and edible flowers. 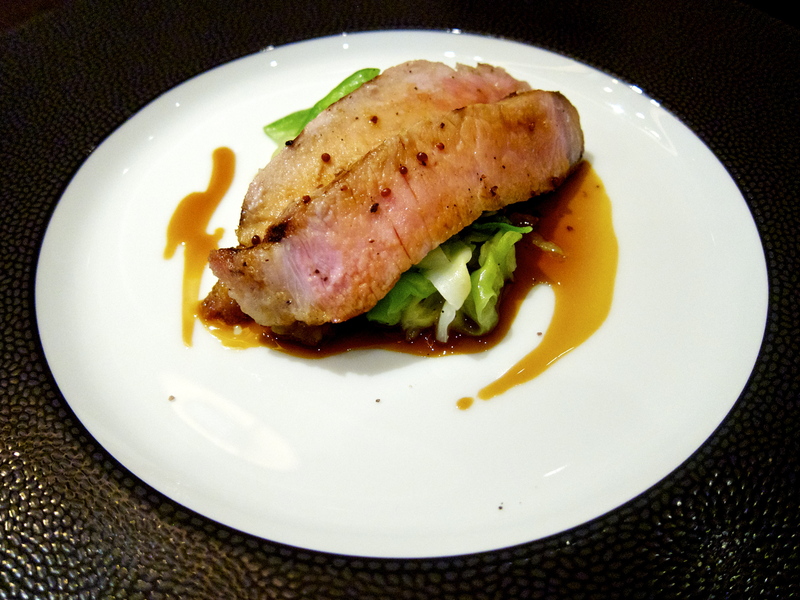 I wasn’t expecting too much; however, once I began eating it, I fell in love with the dish. The salad possessed a great variation in textures and flavors that spoke to me. The dish now adorns the banner of my blog, so I guess that says something. 10/10. 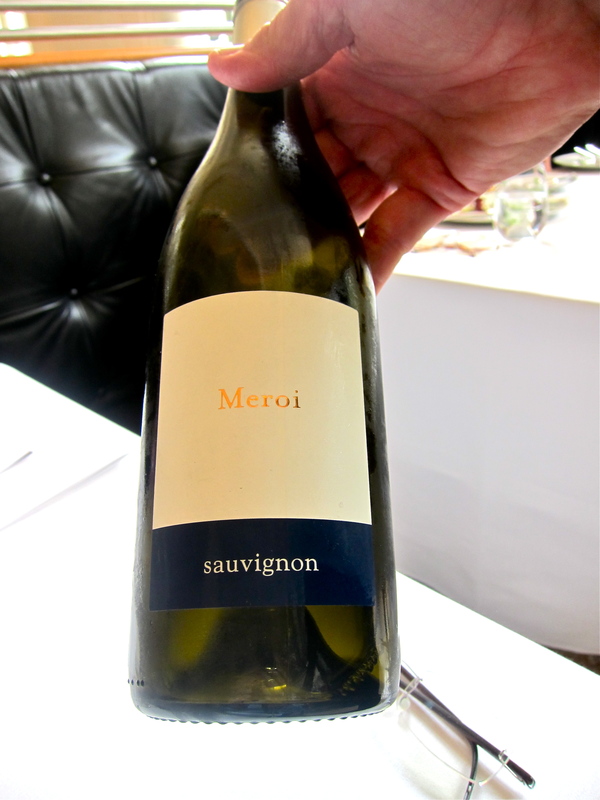 A medium-bodied and deliciously fragrant Sauvignon Blanc was suggested for the rest of the non-meat courses. It fared better with the broccoli dish than the lobster course that was next upon us. The next course was even stronger than the salad. 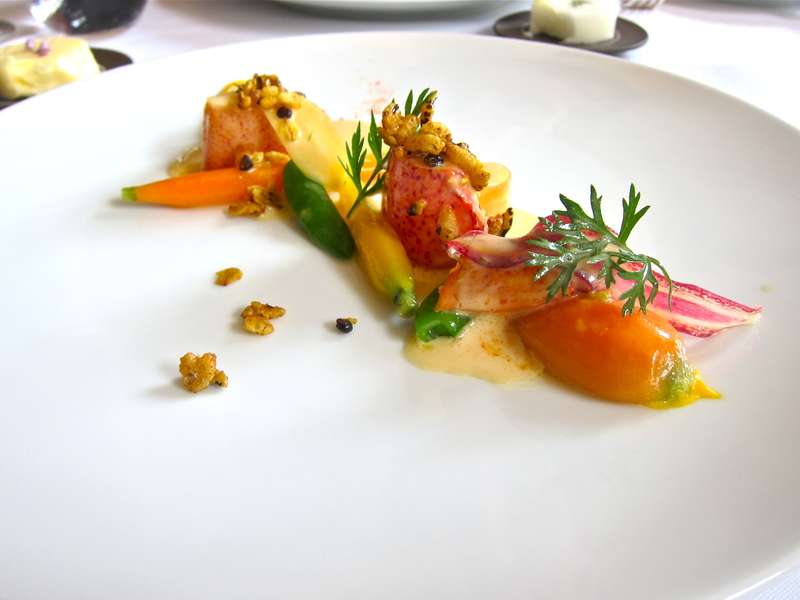 The most perfectly poached lobster I can remember having was complemented beautifully by the butter sauce and sweetness of the carrots, which didn’t overshadow the self-proclaimed star of the dish (‘LOBSTER’ is in all caps on the menu), with the of-the-moment vadouvan granola giving my jaws some more serious work to do. In a word: stunning. 10/10. 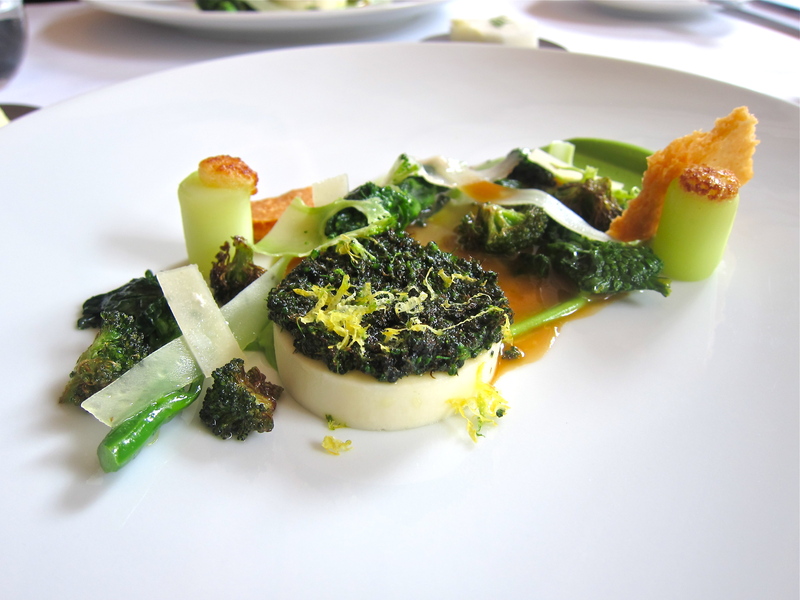 I wasn’t sure about the broccoli dish at first; however, it grew on me as I ate more and more of it. One thing they understand very well at Eleven Madison Park is the importance of texture in a dish, and this shone through here as well. The various forms of Parmesan were delicious and they pierced through the distinct iterations of the green flowering cabbage very well. 7/10. For the meat dishes, we decided to go for a half-bottle of a red Burgundy that was suggested by the helpful and friendly sommelier. Unfortunately, despite having had another good wine from Fixin not that long ago, I wasn’t inspired by this one. It was perfectly drinkable, but didn’t strike a chord. The food elements of the meal had thus far been progressing very well. Sadly, when we reached the two final savory courses – both of which featured meat – the beautiful overture began to decrescendo. The pork dish certainly looked the part. Another thing the kitchen excels at is constructing a striking plate of food. However, the cylindrical shaped loin had been, so far as I could tell, cooked sous-vide, which in this particular case hadn’t done it any favors, or given it much flavor. 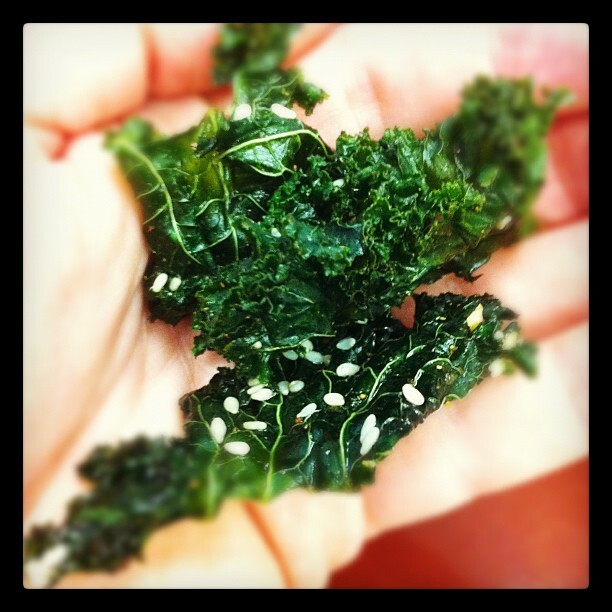 The texture was monotonous and there was no complexity of taste. The little confit cube was mildly more interesting (the belly’s crackling could have had more crackle), but I didn’t feel that the sauce or the accompaniments made this dish more than the sum of its parts. 6/10. 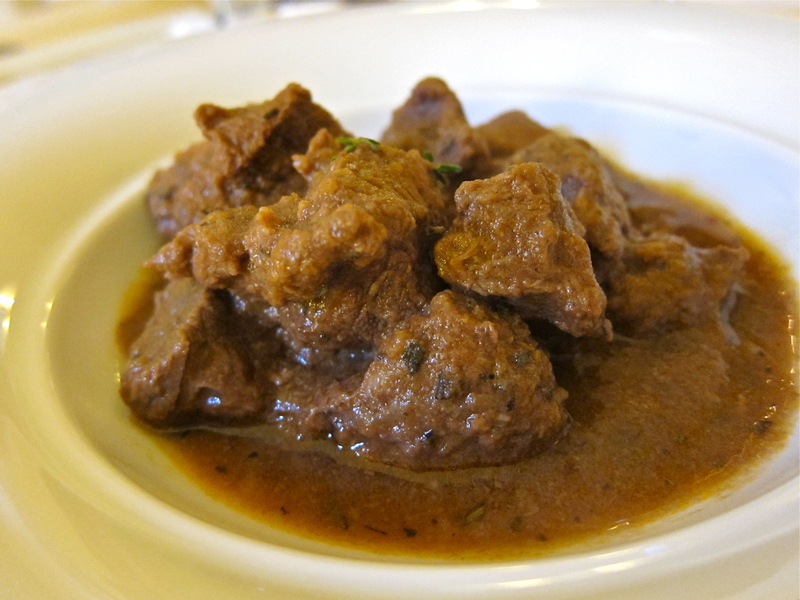 The lamb course was almost identical in its conceit, and received a similar reception from myself and my companion. The long pink strip, which had almost certainly been cooked in a bag, presented the same problems as the leaning tower of pork. 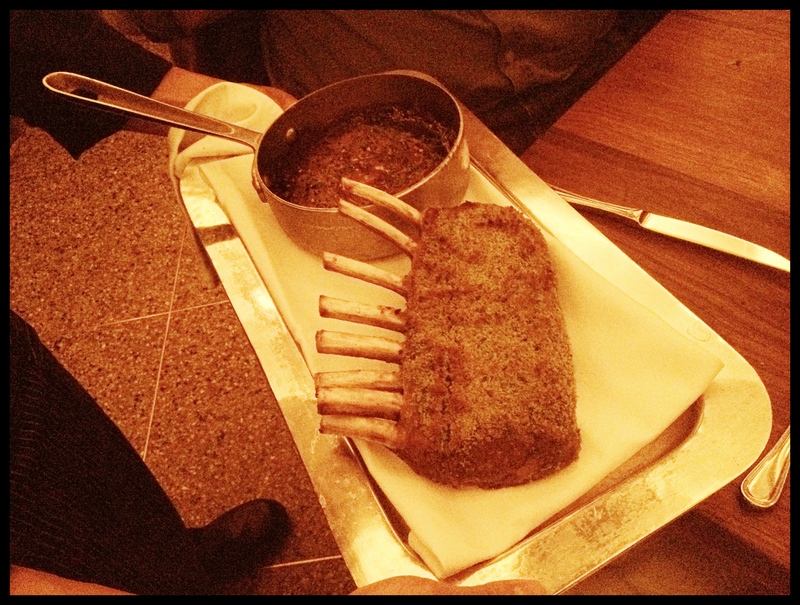 The darker meat – was it lamb breast? – was more flavorful, but again, we felt let down by the supporting cast as they didn’t seem to interact naturally with the star to create a memorable scene. 6/10. At the intersection between savory and sweet, our waiter suggested that we might like to take a brief tour of the kitchen to see us through the interlude. We followed dutifully and were in awe of the mini metropolis that housed the small legion chef whites. I noticed that the back-of-house space had been enlarged since my last visit. The area where we had sat last year – a slightly awkward and dark rectangular room at the back right of the restaurant – had been converted into a sort of interim room where smaller but important tasks, such as making the coffees, were being handled. We were seated at two stools against a wall in a less busy area of the kitchen and watched as a resident mixologist concocted a couple of cocktails, which involved the use of liquid nitrogen in the final stages. The Aperol-based cocktail, which also contained what I believe was a blood orange sorbet, was really delicious, but I did find it slightly awkward to drink it in the midst of the bustling kitchen. It was like being a fly on the wall, but a human-sized fly that everyone could see! 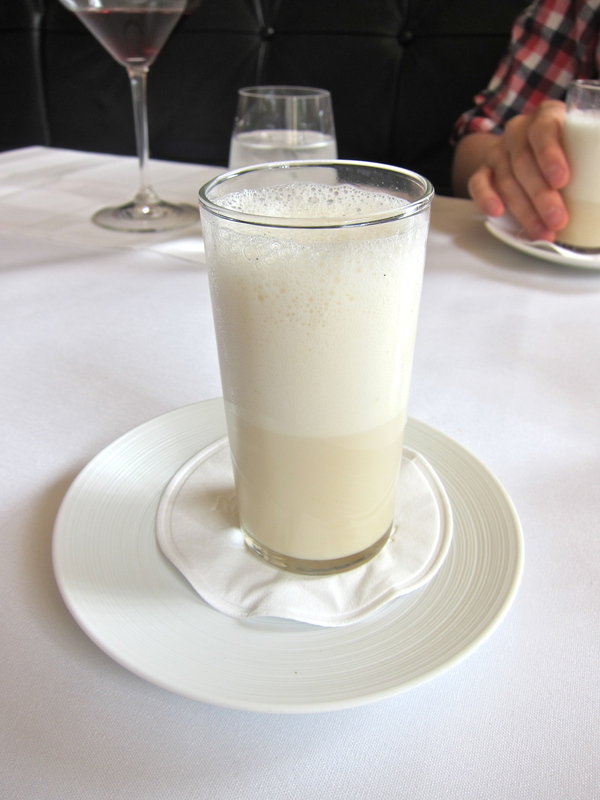 To mix things up even further, after we were escorted back to our table, we were asked if we would like to try the restaurant’s version of a classic egg cream. Now I should state that my father is a native New Yorker and has been known from time-to-time to harp on about the glory that is an original New York egg cream. I guess I am not my father’s son in this sense, since I have never much cared for the combination of seltzer water and milk (call me crazy). However, I am open-minded when it comes to all things edible and I thought I’d give a second (or ‘eleventh’) chance. 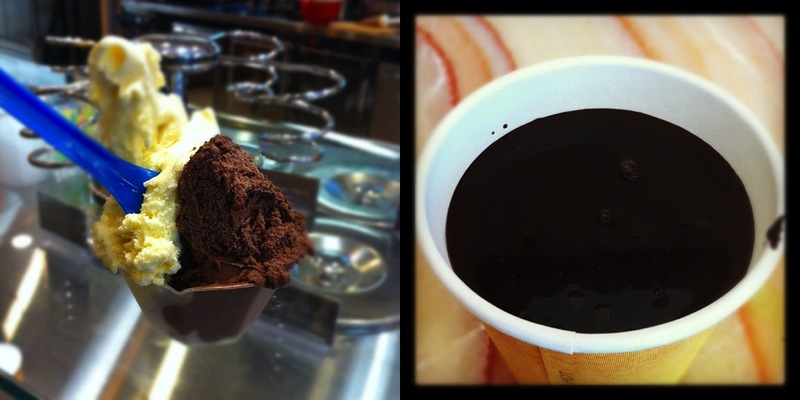 I don’t think their version used any chocolate, but it definitely had malt, vanilla and olive oil. 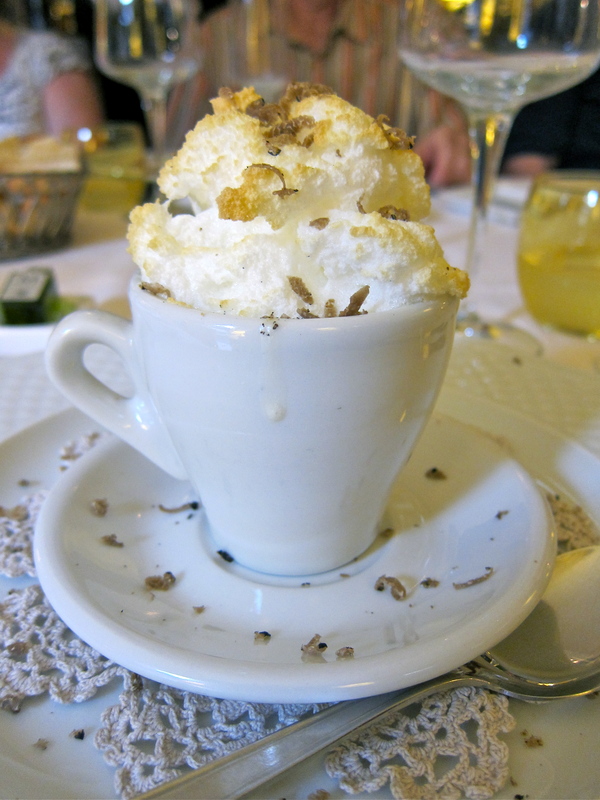 Anyway, I can confirm to you that no matter how good the ingredients might be – and I am sure this was probably the most luxurious version you could ever have – I will just never like sparkling milk. I will refrain from giving this a score as I was predisposed not to like it. I was really underwhelmed with the dessert, which on paper sounded like a great combination of flavors, but in reality didn’t provide any excitement on the palate. In particular, the caramel sauce was simply too sweet. 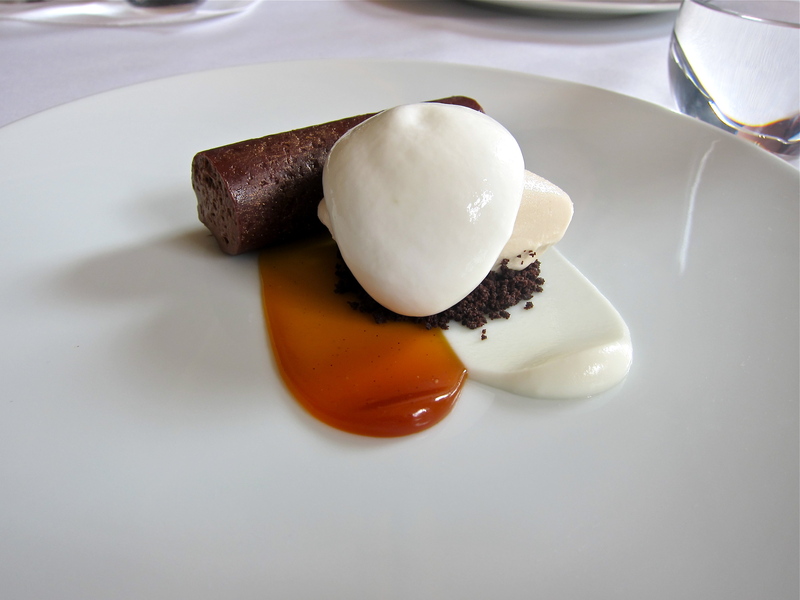 I had hoped for a more creative and satisfying dessert, especially as I realized that the egg cream must have served as our pre-dessert. 5/10. 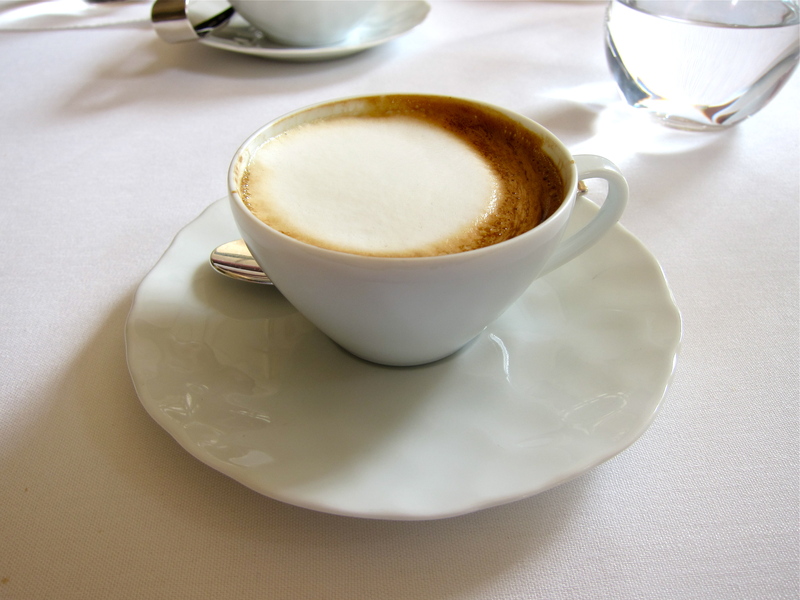 For a restaurant, they can make a pretty decent macchiato though, and I was glad to savor this with some colorful petit fours. 8/10. I know a lot of people who don’t really care for the jellies you often get in fancy restaurants at the end of the meal (or pâte de fruits in French), but I have a sweet tooth and if they are well made, I like them. 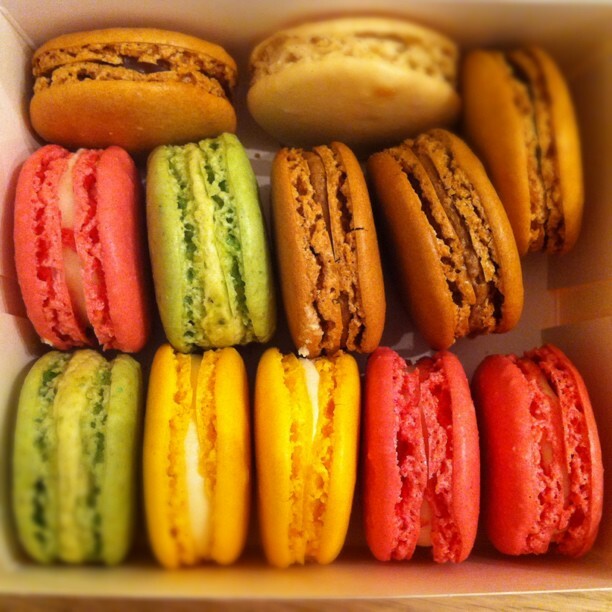 These were pretty good, and the macaron and the tuile were both pleasant enough too. 6/10. 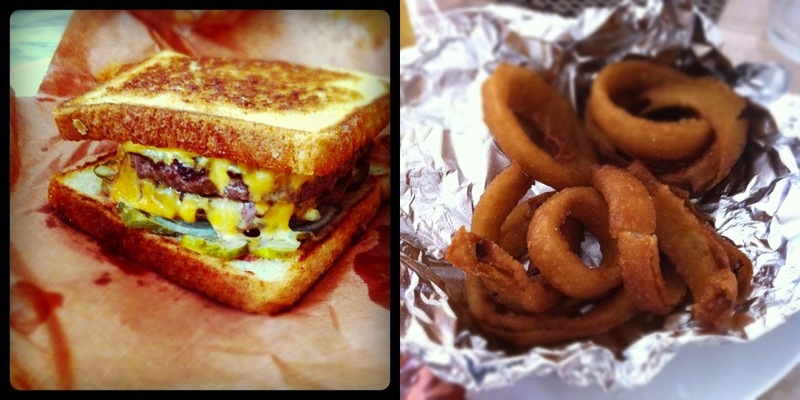 This was really a tale of two meals within one. Everything sang until the meats arrived, which was a shame as the first half of the meal contained some of the best dishes I’ve had this year. 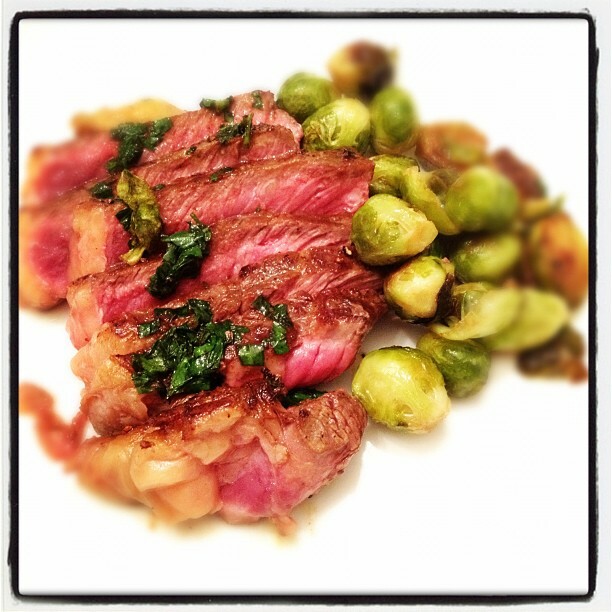 I just didn’t understand the conception of the meat dishes – besides cooking one type of meat two ways, which hasn’t been that original for a long time – and it really put a damper on the meal as a whole, especially as this and the disappointing dessert came at the end, as they usually do. In terms of ambience, the room, while being grand, was absent of a certain animation which was present when I first dined there. The room was also not full, and it was eerily quiet for most of the meal. Don’t get me wrong, I abhor background music in a room and restaurant like this, but the atmosphere felt a little flat. I would also like to briefly comment on the service. I think that the Union Square Hospitality Group must have the best CRM system on the market. When I arrived they definitely knew who I was, when I had last been there, and that I had been a particularly interested/ engaged diner on that occasion. It was plain to see that they were going to go the extra mile – or run a marathon – to make sure that we were well taken care of. There is, of course, nothing wrong with this, and this is the right way to run a business. Heck, it’s probably the main reason Danny Meyer and his establishments are so successful. However, I felt that the approach taken towards our table on this occasion was too overtly over-the-top and oftentimes crossed that thorny border into the realms of being cheesy (sorry, that is the best word I can find to describe it). The problem was that it felt like we had to enjoy everything because it was made to seem like they were pulling out all of the stops for us. 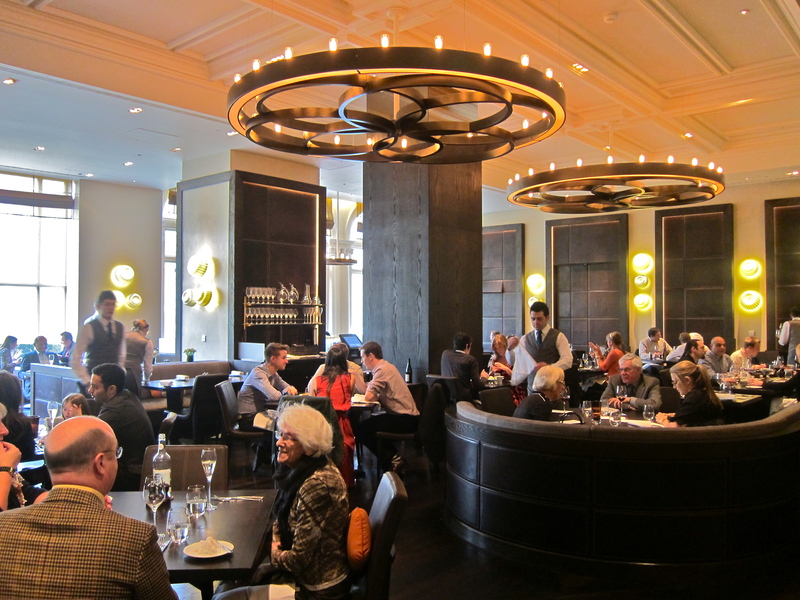 I have no idea if this is the way that every returning (or even first-time) guest is treated at Eleven Madison Park if and when they appear to be particularly interested in the food: very possibly so. I try to be as discreet as possible when taking photos, but people do sometimes notice, and I am sure they did on this occasion, which may have led to slightly special treatment. The last thing I want to do is come across like a whiney blogger who complains about receiving extra attention at a nice restaurant, but all I can tell you is what happened and how it made me feel. It felt like they were trying too hard, like it wasn’t quite natural. 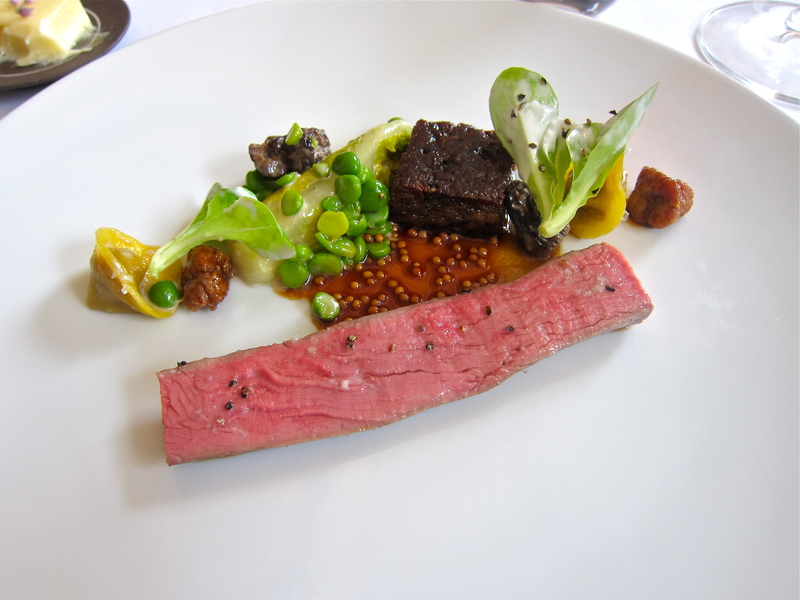 There is a way to cosset guests and make them feel like they are at home, and I didn’t feel like this at Eleven Madison Park. Lastly, with regard to the food, I can’t quite eek out its identity. It contains the occasional homage to America but overall, since there are single ingredients listed on the menu, I can’t get the sense of the cuisine’s personality or ambitions. I wonder how chef Humm would describe his food. To me, it seems to incorporate some very modern techniques (i.e. 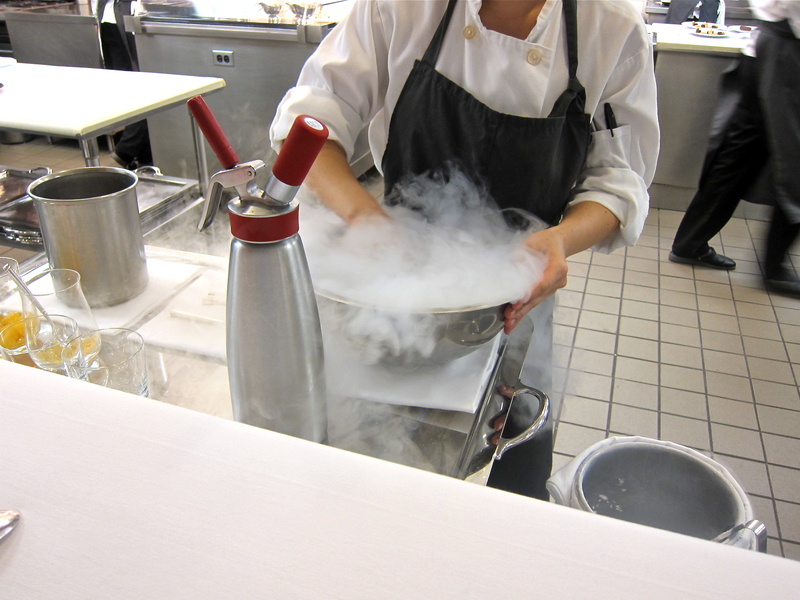 liquid nitrogen in the cocktail, and various ‘snows’ for garnish), as well as some classic European ones (i.e. that truly wonderful roast duck I had the first time around). 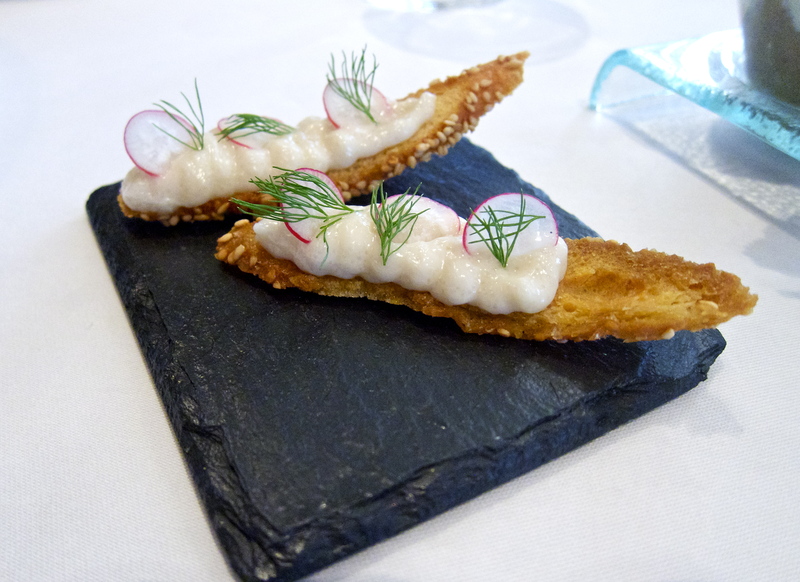 But from my two visits, it doesn’t appear to be beating its own drum or leading the pack, but rather incorporating various trends that are going on throughout the higher echelons of international cuisine. Perhaps I am not familiar enough to be a fair judge, but by focusing on individual ingredients without any obvious overarching conceit, the food seems to lack a sense of soul. In any case, it is a very good restaurant that is capable of some incredibly high highs. 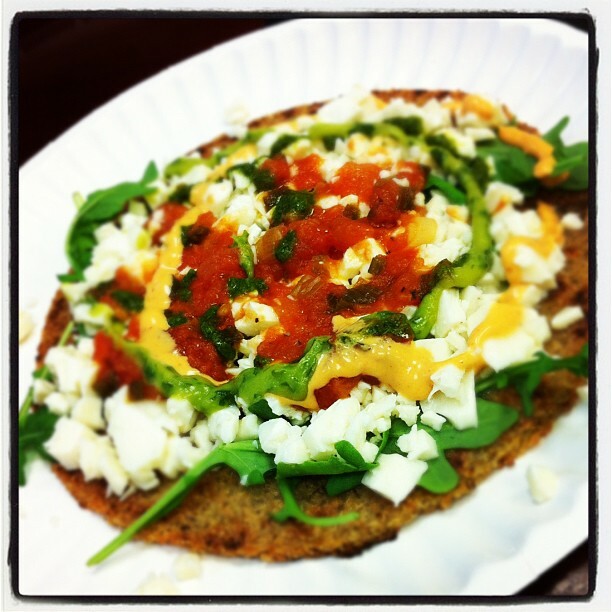 I just wish my most recent meal would have been more cohesive and consistent. Perhaps my expectations were as grand as the dining room. Would I return? Yes, but not for a while, and I would probably ‘just’ get the three or four course menu and inquire and/or direct more specifically how each dish will be prepared to avoid potential disappointment. 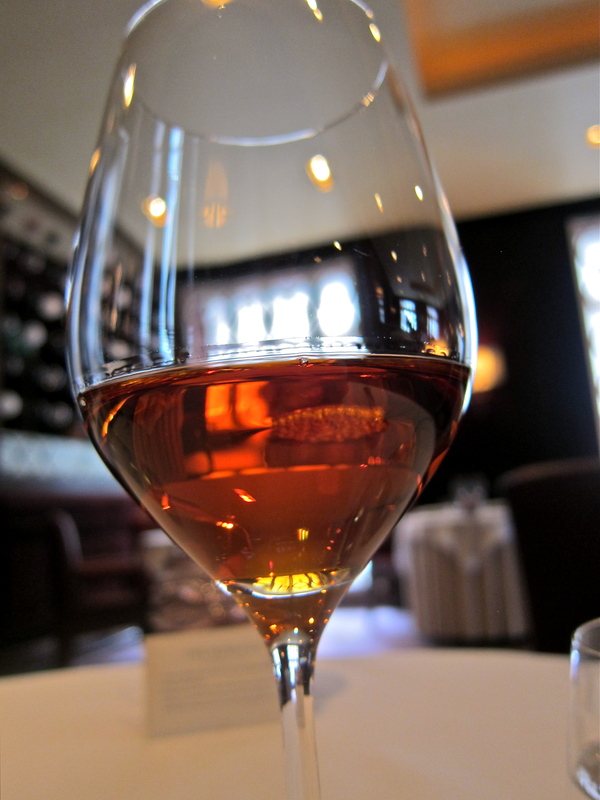 Wine: they have one of the most extensive and best-chosen wine lists in NYC, and it is truly a pleasure to peruse. There are trophy wines and undiscovered gems alike. France, Italy, Spain, Germany and California feature heavily, but other regions are represented throughout as well. They have a very nice selection of half-bottles of red and white wines, which is much better than you typically see. My only gripe is that they should have a few cheaper options by the glass. I was asked by esteemed fellow blogger @gourmetraveller to participate in a project called ‘My 7 Links’, which is organized by Tripbase. I haven’t really done a ‘meme’ post before, but thought this particular one would be a nice way to review my last two years of food and wine, re-focusing attention on some highs, some lows, and the unexpected. So, without further adieu, my seven links. 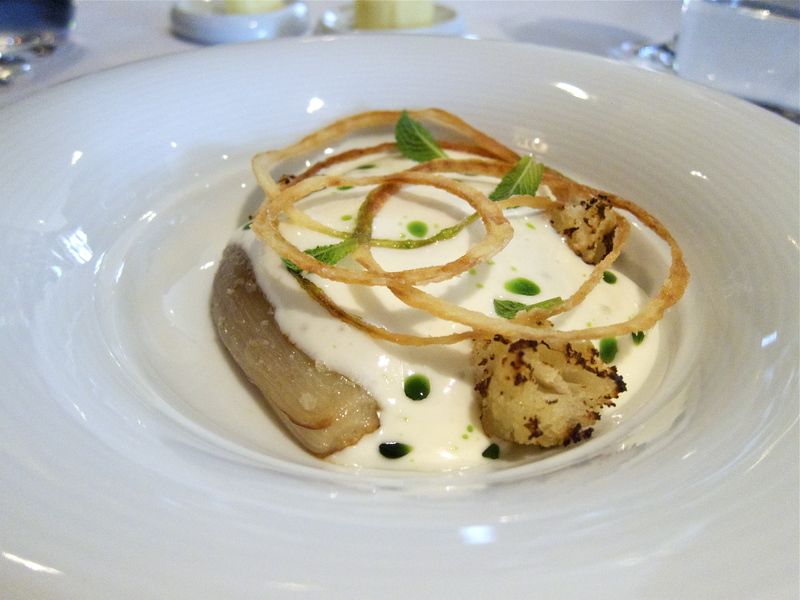 I guess it comes as no surprise that my most popular post is a review of one of the UK’s high temples of gastronomy: Heston Blumenthal’s three-star Michelin restaurant, The Fat Duck, which was also awarded ‘Best Restaurant in the World’ by the Restaurant Magazine / San Pellegrino ’50 Best’ awards in 2005, and has been in the top five since 2004. Given that a large portion of my readership still hails from the UK and that Heston Blumenthal has become a very popular figure on TV and in the country’s print media, it makes sense. 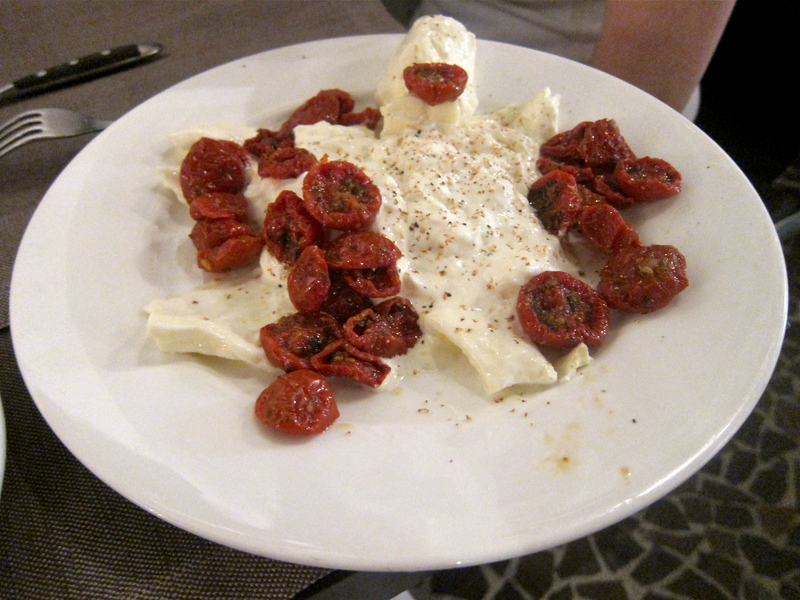 Happily, it was also one of the better meals I’ve had the pleasure of eating since I started this blog. I also like the chef’s approach towards food and his concept of ‘the meal’, and think he’s one of the more consistent and genuine characters in the higher echelons of chefdom. I therefore have no qualms about the success of this post. It is unfortunate that my most controversial post came from a restaurant that I so much wanted to like. You see, Michel Roux, Jr. was a new hero of mine at the time, and I desperately wanted to love his food and his restaurant, which I saw as an extension of him. Unfortunately, we did not have a pleasant experience at all – it was certainly not befitting of its dual Michelin-starred status. This was one of my first posts, back in the days when I didn’t take photos, so sorry for the lack of visuals, but this was probably the angriest review I have written (which just goes to show I’m a big softy). The anger wasn’t due to the fact that Mrs. LF annoyingly had a big crush on him (and still does), but rather the bordering-on-rude service we experienced. It put me off ever returning this traditional yet quirky subterranean dining room. The signature cheese soufflé and innovative wine pairings were the only things that mitigated what was generally a very disappointing experience. 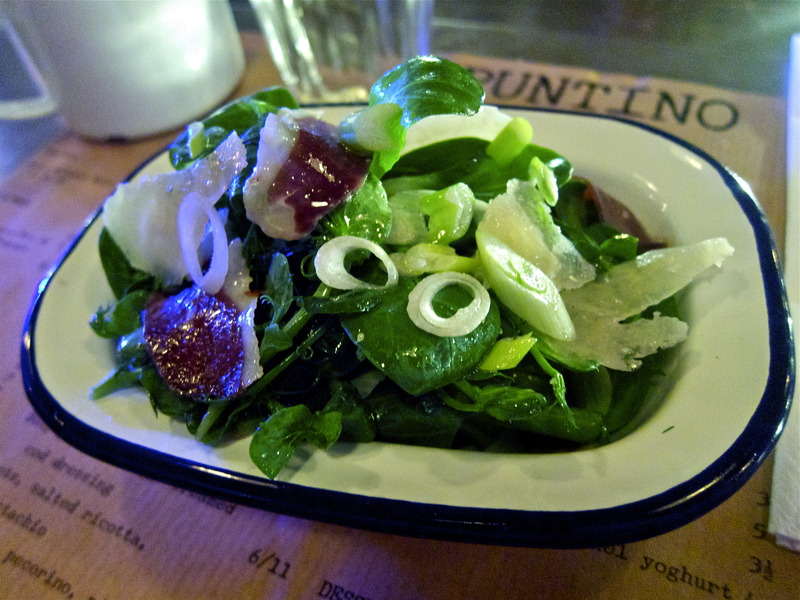 I really didn’t expect my post about a supper club in the East End of London to get the attention it did. But I guess The Loft Project is a pretty unique concept, as they do get some of the most interesting young culinary talents from around the world to cook for a few nights for 12 or so lucky guests. It’s not cheap, but for what you end up getting (sometimes 8+ courses with a wine paring included), it can often end up being phenomenal value. 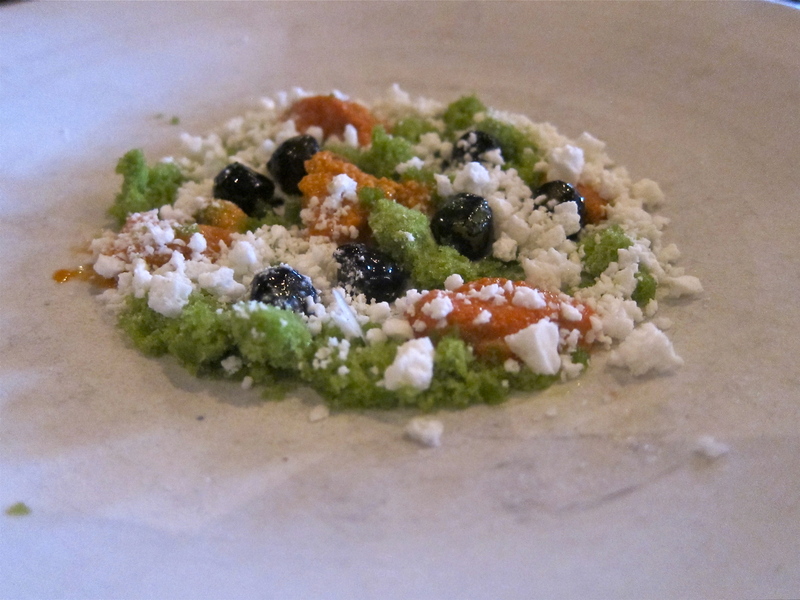 Anyway, the meal that Yorkshire man Samuel Miller – who is second only to Rene Redzepi himself in noma’s kitchen – stands out as one of the best dining experiences I’ve had anywhere. It was a wonderful evening in every sense, and for all my senses. 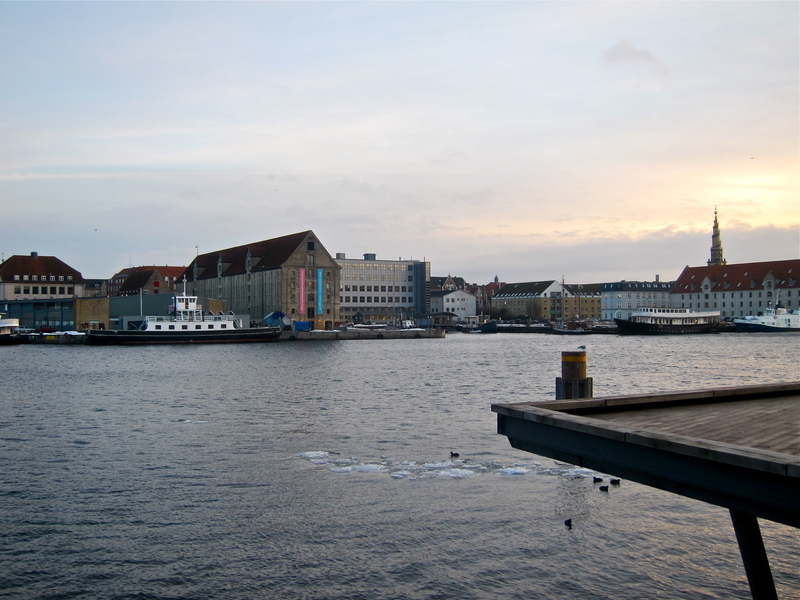 The technical reason why I think it got so many views is because there was a television show on one night about noma, and Sam featured prominently in it, so I got a lot of people coming to the post after googling his name alongside the word ‘noma’. As of now, it is my 7th most popular post. 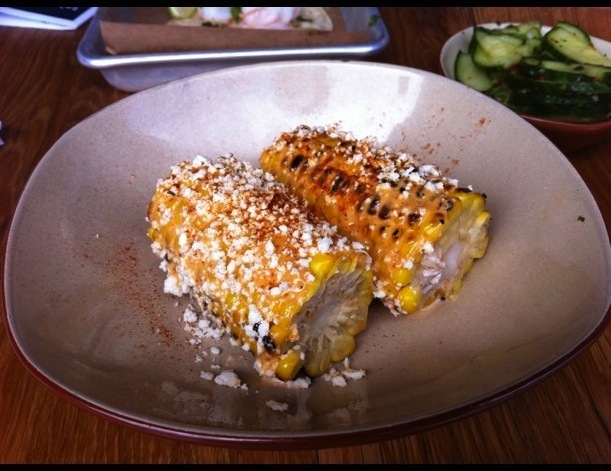 Maybe it was the signature cheesy title, but I was surprised that my review of Morgan M. – which is one of only two reviews listed on Urbanspoon in nearly two years – did not garner more attention. 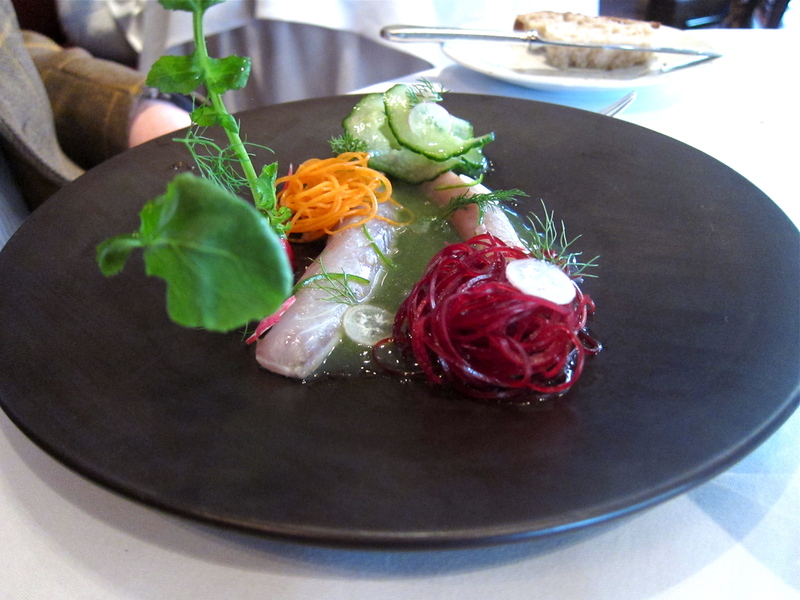 Although the service was a little uneven, the food was certainly beautiful to look at and tasted very good to boot. I had really wanted to highlight this little gem of a place, which takes advantage of cheaper rent in North London but produces traditional French food with ample flair that competes with many of the more popular (and much more expensive) French restaurants in central London. The natural light during our lunch also allowed for some great pictures, making this one of the prettier posts I have done, IMHO. I was pleased to learn the other day that chef Meunier is, after many years, opening a second restaurant near London’s Smithfield Market. Note: there was another post, which was somewhat controversial and also barely got any views, to which I would also like to direct your attention. It is an interview with the editor of Tong wine magazine, a publication that brings much-needed diversity to the global conversations taking place about wine. Read it here: Filip Verheyden is TONG – About Wine. The food at The Sportsman, a one-Michelin star restaurant that could easily be mistaken for an unremarkable pub on an unremarkable stretch of England’s Kent coastline, is in many ways deceiving. It is presented simply and humbly, and you might not give it too much thought. However, the fact that a good deal of what you are eating comes from within a few mile radius of the restaurant, and that there is considerable technical skill and bounds of flavour packed into each bite, can take you by surprise if you’re not expecting it. One of the two brothers who own the pub is the (mostly self-taught) head chef and the other oversees the front of house. The interior has been honestly restored and locals still do come in for a pint at the bar, even if the bulk of the reservations now come from patrons living further afield. 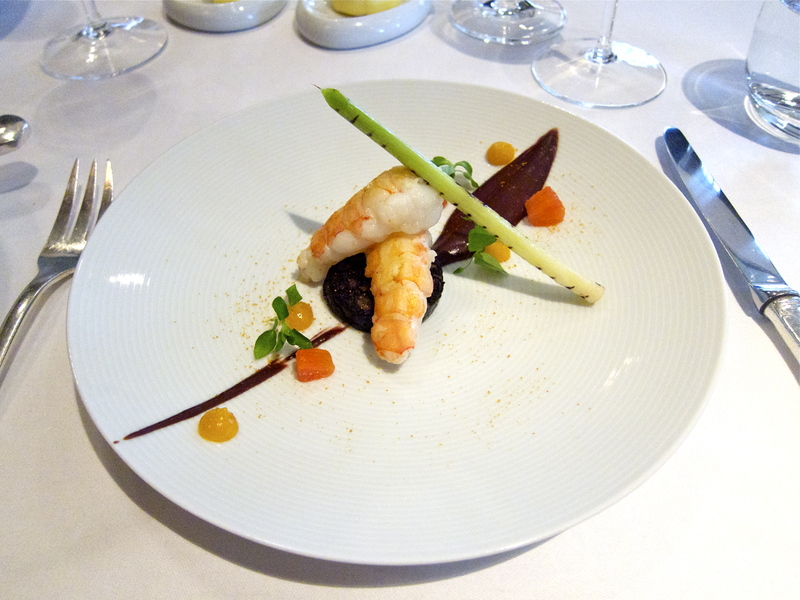 The tasting menu, which is available during the week, is well worth a visit, but requires special booking ahead of time. Although the dishes are certainly not as artistic as many other restaurants I have reviewed, I felt that overall, the images from this post were the most beautiful when taken together as a whole. The light was fantastic on the day, and for the most part, these images received almost no retouching. I hope you enjoy reading and looking at it. Not only was I proud of myself for simply finding a way to eat at what has now been ranked as the ‘best restaurant in the world’ for two years running, I was also pleased with the review I wrote. It was very long (hey, what else is new? ), but it managed to synthesize my numerous thoughts and emotions about the restaurant and our meal. The food itself is also breathtaking to look at, and while my photos don’t really do it justice, this also made it a visually appealing post to me. Hopefully you feel the same. I don’t know how truly helpful my posts are to readers – after all, I mostly just eat and don’t cook – though I did feel like I was providing a good service to the residents within walking distance of London’s Primrose Hill when I consumed copious calories over a number of visits to a cute little pâtisserie and café run by Japanese chef Masayuki Hara. These multiple visits confirmed that the pastries were generally very technically well made, plus some of them benefited from an injection of Japanese flavor (i.e. 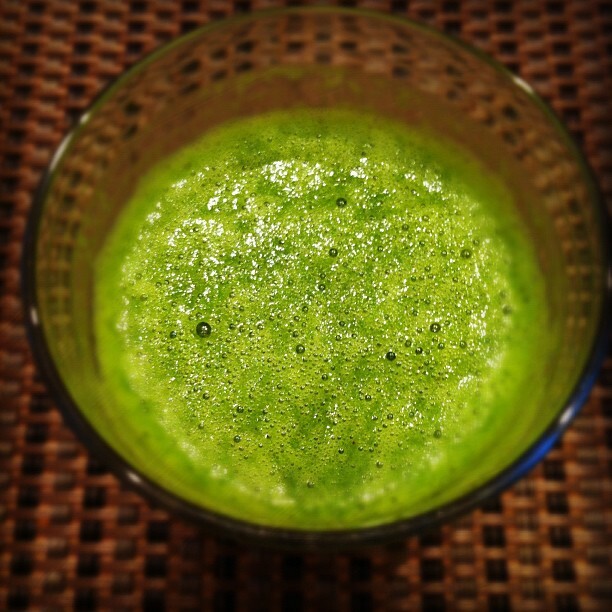 green tea features prominently in a few of the treats). They have also gradually expanded the range of food, which is simple but very tasty, and have a good selection of high-quality teas and coffee (they use Monmouth beans, or at least did on my last visit). 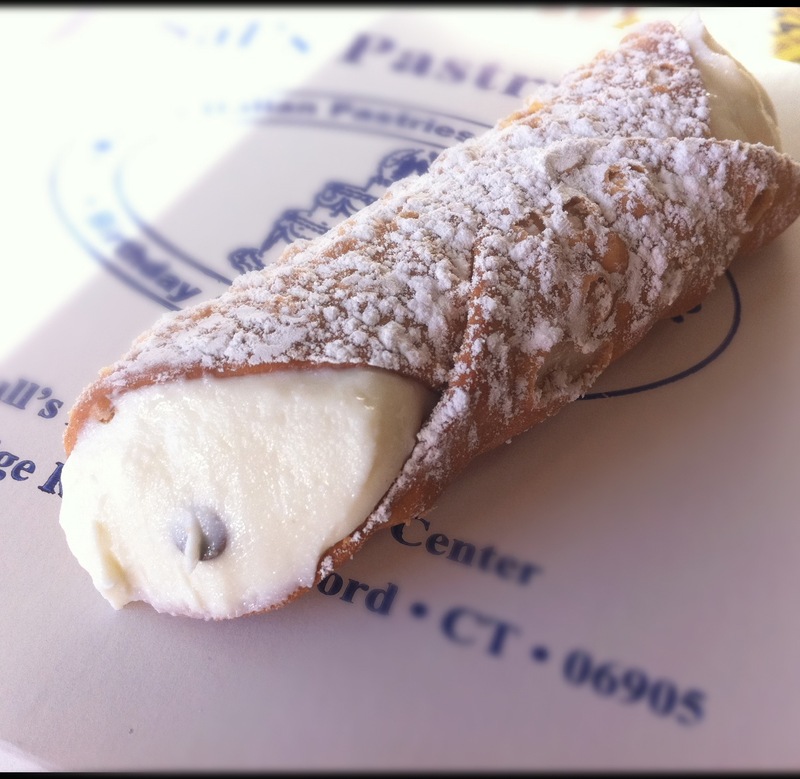 If you are in the neighborhood, I’ve found it is normally worth the extra calories that a visit entails. The hot chocolate is also good. I would now like to direct your attention to five great food-related blogs that I follow regularly, all of whom have agreed to do their on ‘My 7 Links’ post in due course. Look out for their reflections on their old chestnuts. The are listed alphabetically…like, duh. Heston Blumenthal’s first London restaurant has set the UK’s food media into a frenzy. And with some good reason – the food is pretty good. In a similar vein to the Fat Duck, there is a lot of work that goes into the creation of each dish – both intellectually and in terms of the technical skill required to consistently replicate each deceivingly simple dish on a much grander scale than any of his Bray outposts. 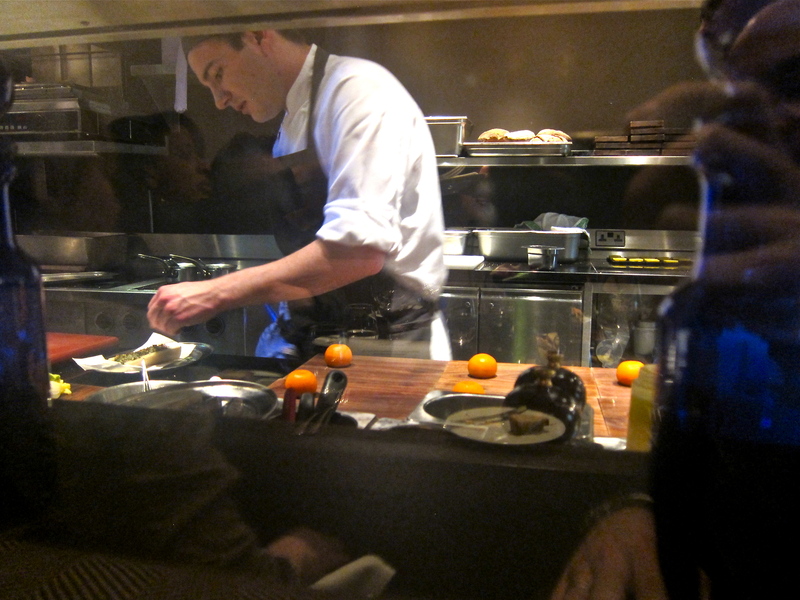 The kitchen generally pulls it off, and the service seemed to be pretty spot-on when we dined there (though we were at the chef’s table, so you would expect nothing less). 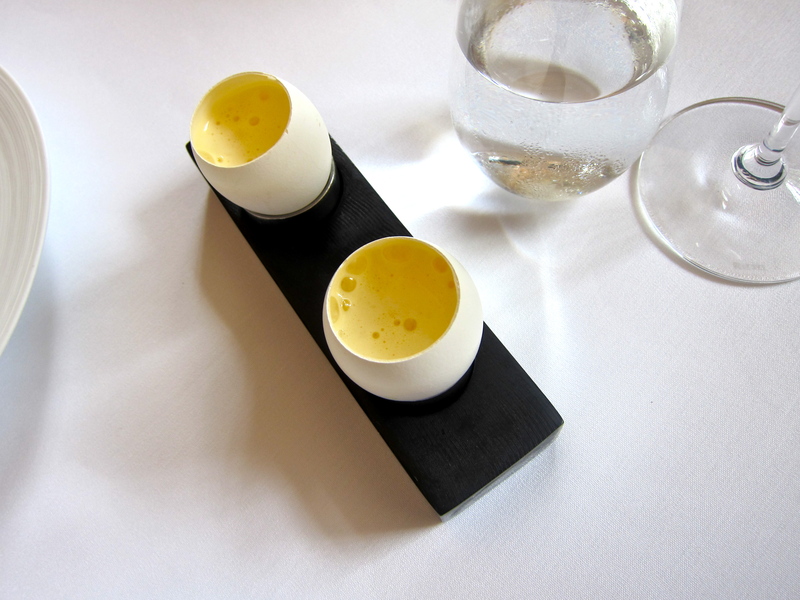 Don’t come expecting the dramatic culinary theatre that Heston is famous for at the Fat Duck – and on many of his TV programs – as the dishes here are far more straightforward in their presentation, with a few exceptions. With a windowful view of Hyde Park – thanks to the newly installed floor-to-ceiling windows – and its very own Swiss watchmaker-fashioned rotating gas-fired rotisserie for pineapples, it’s definitely worth trying when in London. First things first. This post is late in coming. Very late. I won’t bore you with why, but apologies for the lack of activity for the last month or so. This is the last of my posts from the at-one-point recent trip to London I made earlier this year. And what a way to end. But in every end there is a beginning, as one of my favorite poets often said. The only way I could actually score a table at what was then being billed by most as the hottest restaurant opening in London in a long time, and by some as the best new restaurant in the world (which was probably taking things a little too far), was to book the chef’s table. When I enquired, I found out that there is technically no fee for booking the table, but there is a minimum spend of £900, which can be split amongst up to six guests…so definitely the more the merrier. The £150/person price, in the case of six, pays for the tasting menu, which enables you to sample much of the à la carte menu. Drinks and service will cost extra. One small point, which relates smaller people. We wanted to bring our daughter with us (who at the time was nine months old), and although this seemed to present a problem at first, the issue was eventually resolved (indeed, there had been no issue in the first place but we seemingly had been misinformed the first time around), though not without some time and effort. 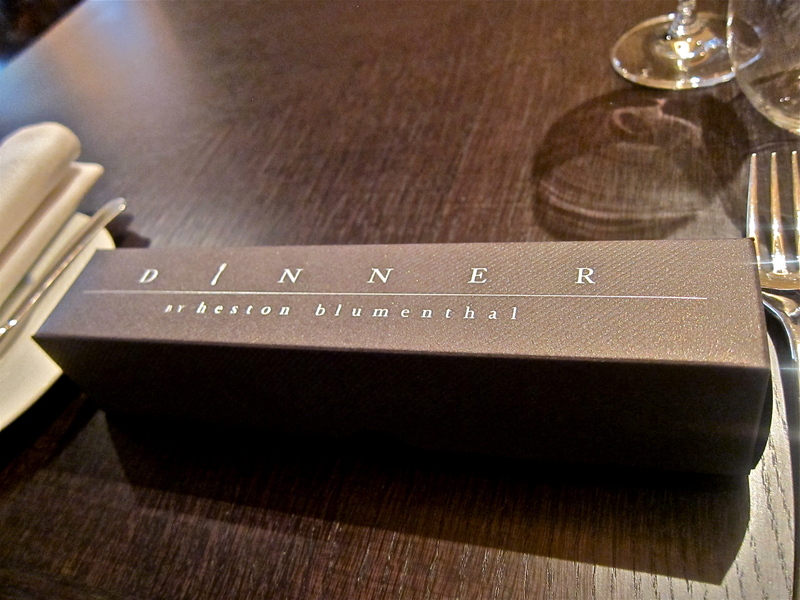 In any case, I will assume for the benefit of most readers that you know who Heston Blumenthal is (if not, see my previous review of his Michelin 3-star restaurant in Bray), and that you know that ‘Dinner’ is his first restaurant in London. 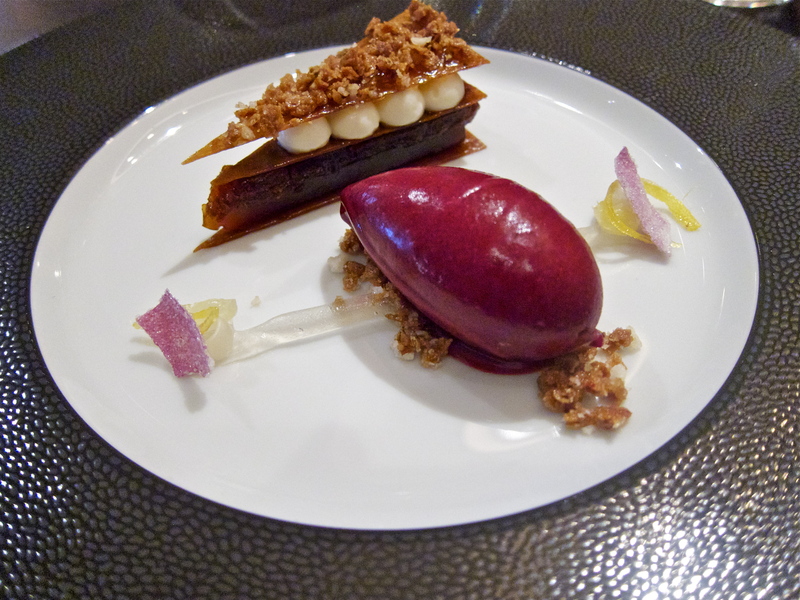 You can read about the word play – a typical example of Heston’s historical whimsy – on the restaurant’s website or in many of the other reviews out there. Apparently, the Mandarin Oriental, in which the restaurant is housed, insisted that they use his name on the masthead, even though he personally will not be the chef at the restaurant – a fact he has been refreshingly transparent about from the beginning. Heston’s right-hand man, Ashley Palmer-Watts is in charge of quite literally a small army of chefs (there are more than 40) and kitchen staff, most of whom remain cleverly shielded from the restaurant’s customers, who are likely none the wiser. There are 126 covers at Dinner, which makes it by far the largest of Heston’s restaurants – the Fat Duck only has about 40 covers by comparison, and his two pubs in Bray (the Hinds Head and The Crown) are also far smaller. 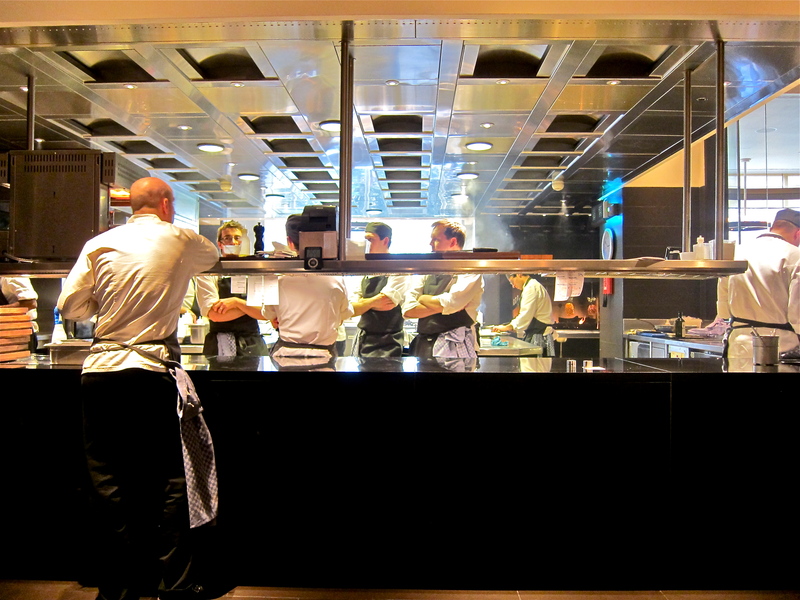 The part of the kitchen that is visible to diners is open, though mostly covered by a sheet of glass that comes down from the ceiling. There are two large islands in the kitchen, which were custom-made by Rorgue, that utilize multi-point induction hobs. As many readers will already know, Heston is well-known for using the sous-vide (or ‘water bath’) method for cooking many of the proteins in his dishes, and there are correspondingly seven large built-in water baths in the main kitchen itself. 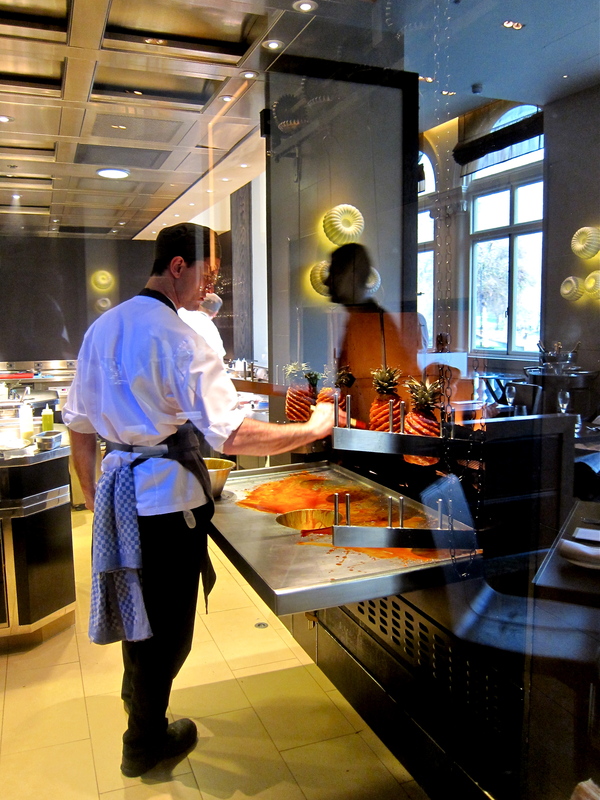 There is also a Josper oven, which can reach temperatures of over 930° F, which is used for the beef dishes. 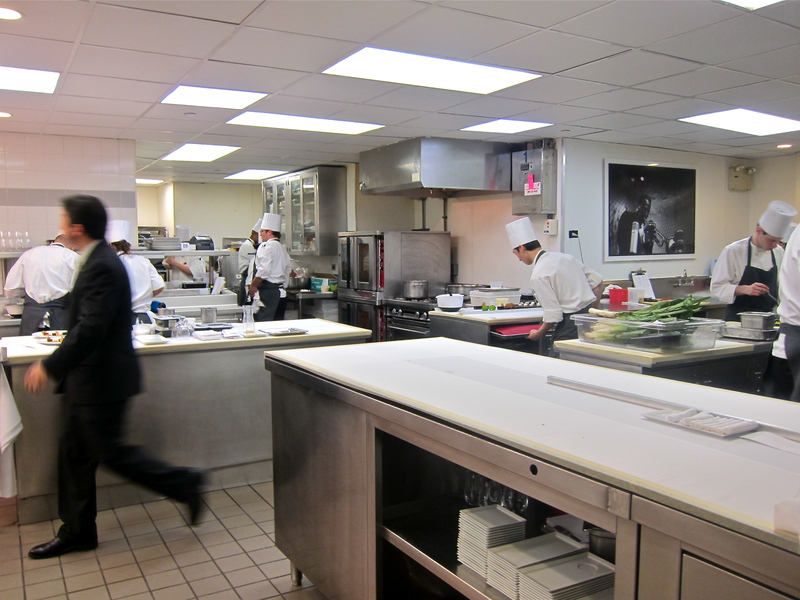 In addition to all of this, there is a pastry kitchen, which is more or less hidden behind the chef’s table, and there are more prep kitchens located out of site in the bowels of the hotel. The design of the restaurant is pleasant enough, without demanding your attention. But once you begin to look around, you do notice that in true Heston style, no detail in this Adam Tihany designed room has been left unconsidered. The space is very open, with high ceilings and floor-to-ceiling windows that were newly installed with the changing of the restaurant’s guard. Brown and gray hues dominate the lower reaches, with wood flooring, unadorned wooden tables, and classy cushioned banquettes. Then there are the oft-noted jelly mold (or possibly cake mold) lamps and the Swiss watchmaker Ebel-designed chrome and steel pulley-operated rotating gas fire rotisserie…for what else but pineapples. The front of house is also smartly attired in well-tailored suits and waistcoats. Being at the chef’s table, we had the benefit of each course being presented by the head chef himself. The table itself is very spacious and comfortable for the full party of six, and is arranged in a u-shape that directly overlooks the pass of the semi-open kitchen. Ashley wasn’t there on the day of our visit, but we couldn’t have been happier with the extremely personable Sous Chef Dale, who was heading up the kitchen in his absence. 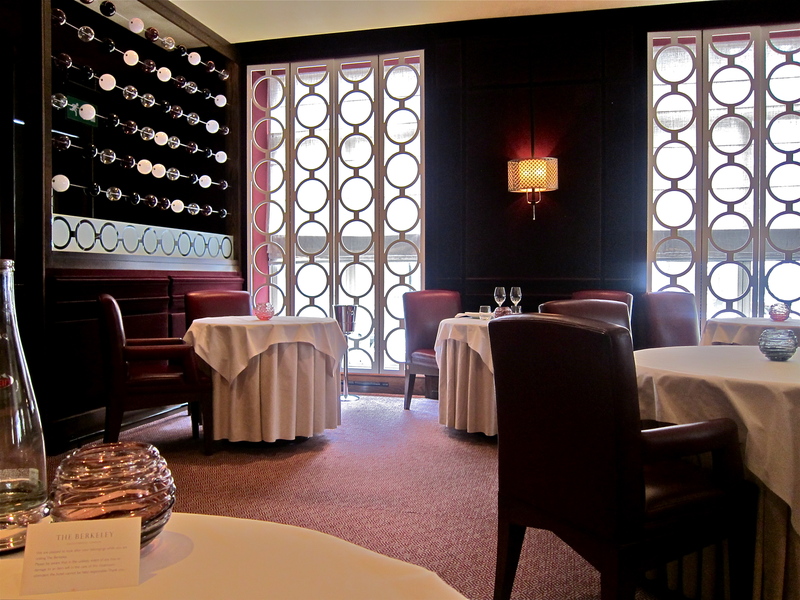 With Baby LF comfortably seated in one of the corners of the bench seating, some of us opened the beautiful boxes that had been laid down in front of us to peruse the tasting menu. The good thing about sitting at the chef’s table is that you get to try a lot of what the normal menu has to offer. 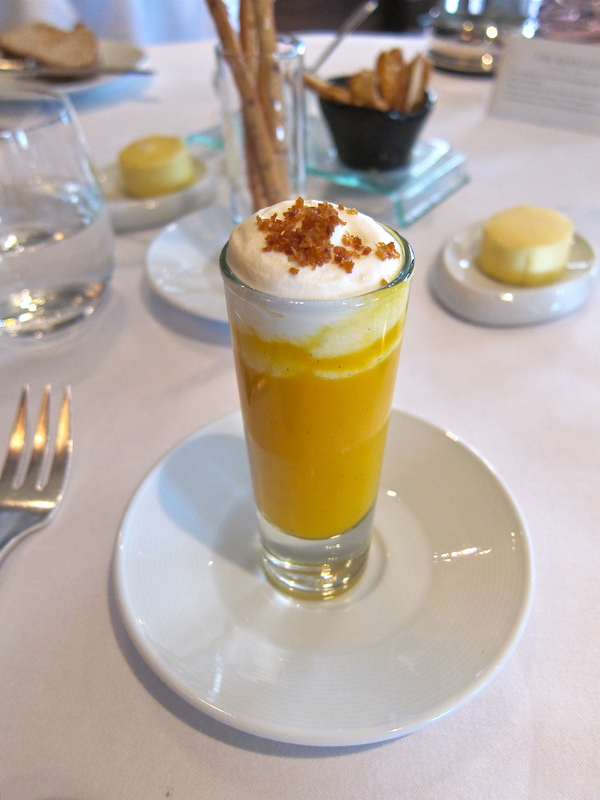 In fact, there are no special courses, but rather tasters of the à la carte menu, plus a little surprise at the end which has not yet been rolled out to the main dining room so far as I am aware. 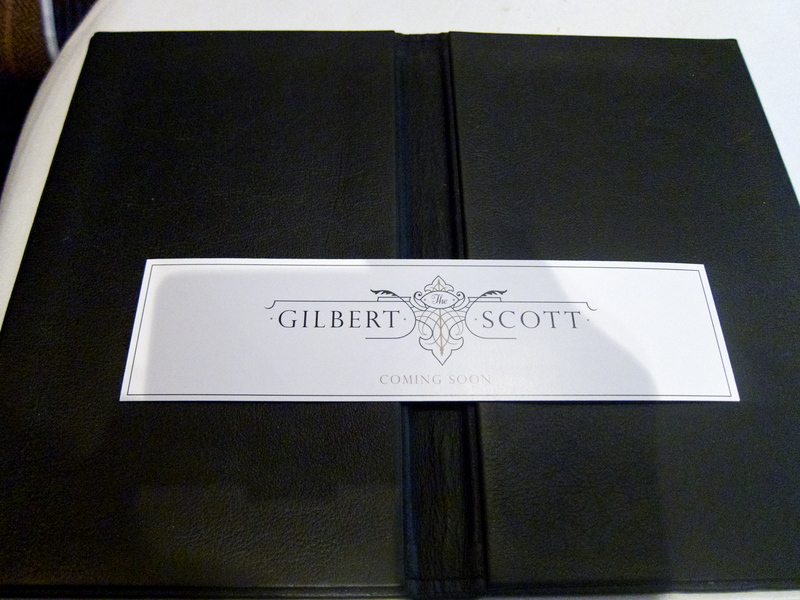 We did have a quick a look at the menu, although you can obviously keep it a surprise and take it home as a souvenir. However, I wanted to ensure we would be able to taste all of the dishes I had in mind – by this point I had distilled all of the reviews into a list of must-try dishes – so we ended up adding a couple more things to share between the table, something the kitchen was happy to accommodate. While we waited for the first course to arrive, we nibbled on some good quality bread and salted butter, and got comfortable in our little semi-private enclave. 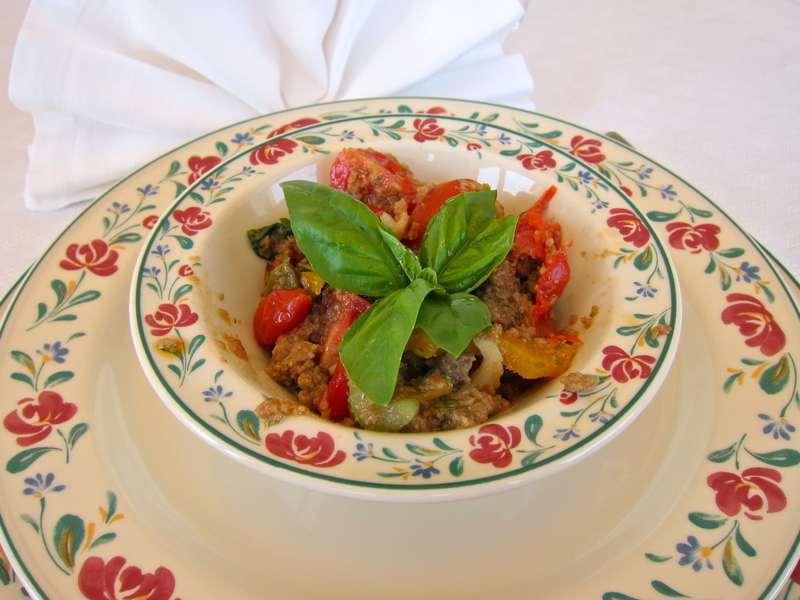 This was a pleasant, light and flavorful beginning to the meal. 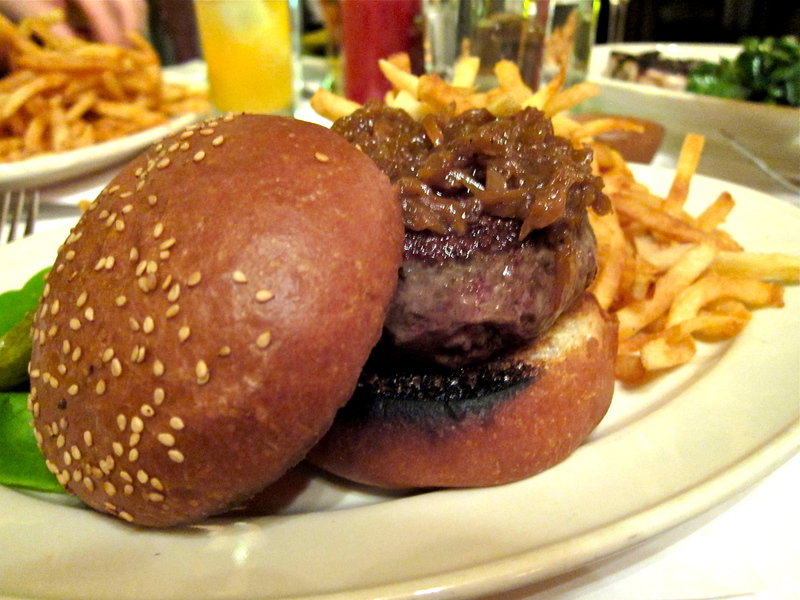 Gentleman’s relish is the nod to history within the dish. Also called patum peperium, it is basically an anchovy paste, which in this case was quite mild and was formed from garlic and anchovy paste as well as a lemon mayonnaise. 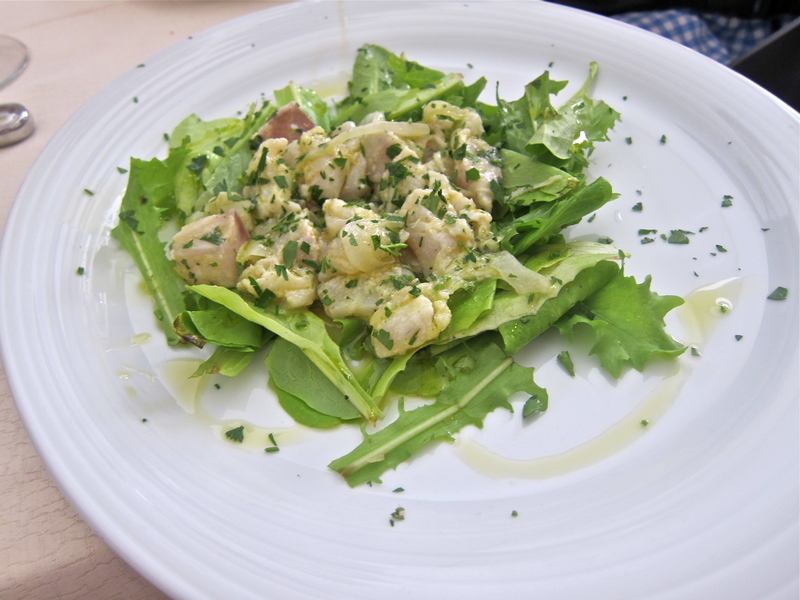 The pickled lemon salad on top interplayed well with the smoked mackerel, which had a good texture to it. It was perhaps not the most cleanly plated dish, but the flavors worked harmoniously and I enjoyed it. 7/10. I don’t think there is much to say about this dish if you have already read about it elsewhere. 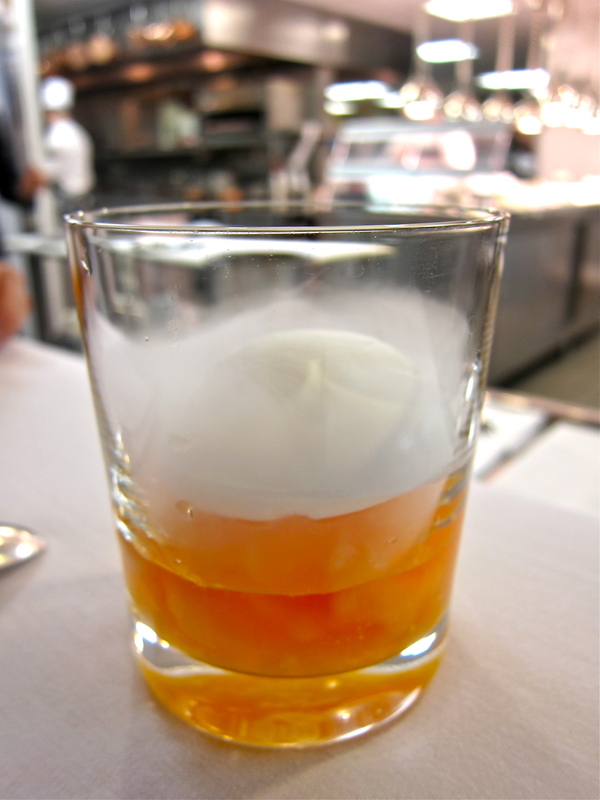 Suffice to say that if you did not know that the inside consisted of chicken liver parfait, you could easily be forgiven for thinking it was an actual mandarin orange, so accomplished was its guise (for those interested, the parfait is frozen so that the gel can set and then it defrosts naturally). 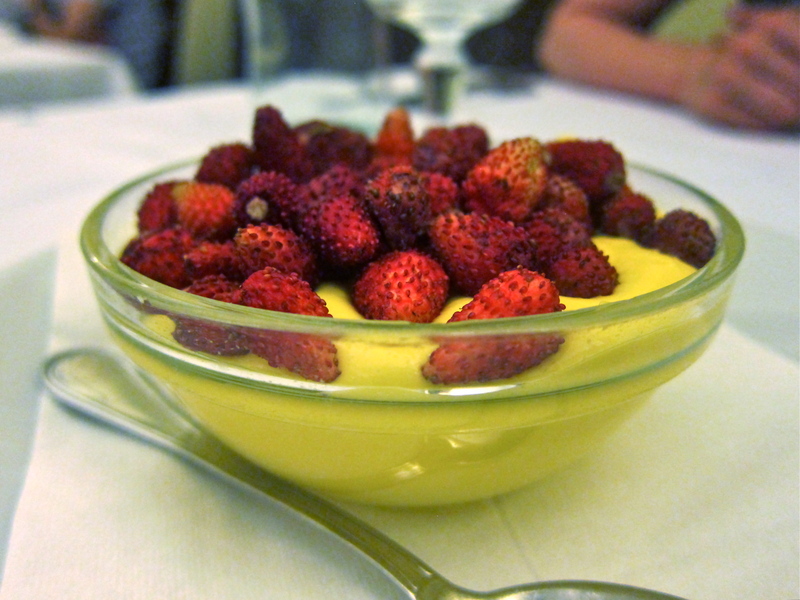 The only thing that was not edible was the faux stem and leaves plucked into the top of the creamy spread. What I will say is that the mandarin flavor provided by the outside jelly casing provided a faint but lovely citric counterpoint to the rich foie gras pâté. Jelly is historically a common partner to foie gras, so perhaps this was the nod to the past that the dish was going for. The bread was grilled nicely, with five distinct lines of char, and was the perfect vessel to carry this little ball of mandarin madness to your eagerly waiting mouth. (As a side-note, I am sure the hotel is not too upset that the this dish has almost become the mascot for the restaurant given the fruit after which it was fashioned :)). 9/10. Much like Billy Joel, we were quite content with a bottle of white and a bottle of red for our meal (even though it wasn’t an Italian restaurant) as not everyone was drinking. However, with the meat fruit I sort of made people have a glass of this above Tokaji. Good thing too, because it was pretty remarkable. It was elegant and had a lingering clean finish that kept it from being anywhere in the vicinity of cloying, and it paired remarkably well with the meat fruit. Highly recommended. 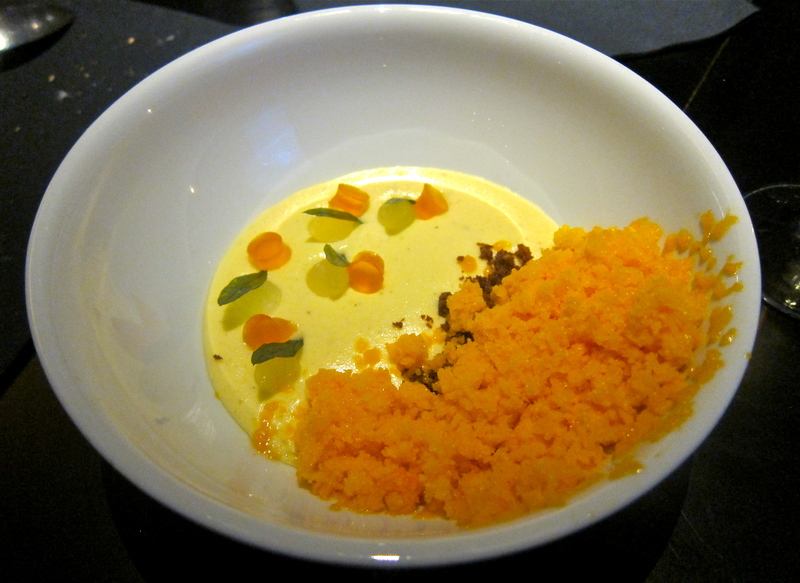 I had really wanted to try Heston’s version of Risotto Milanese, which at Dinner dons a rather more evocative moniker. The table was split on this one. 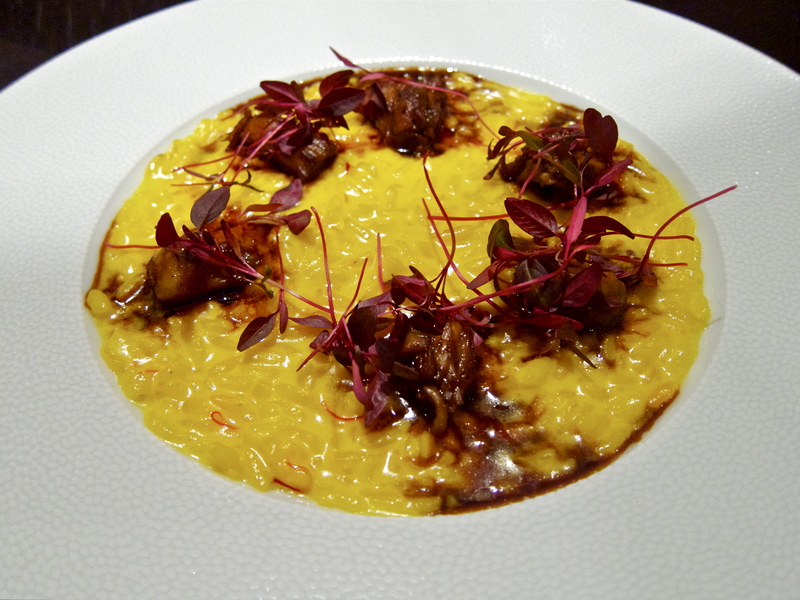 While the rice was perfectly al dente and the calf tail was gorgeously rich, the dish did have a very strong zing of acidity to it – I would assume from the saffron – and while I didn’t find it off-putting, some did. I thought the garnishing of red amaranth was a nice touch. I will refrain from scoring the dish as everyone just had a spoonful or too and it wasn’t mine alone. This dish seems to have gotten a bad rap from many people who have been to the restaurant and reviewed or commented on it. 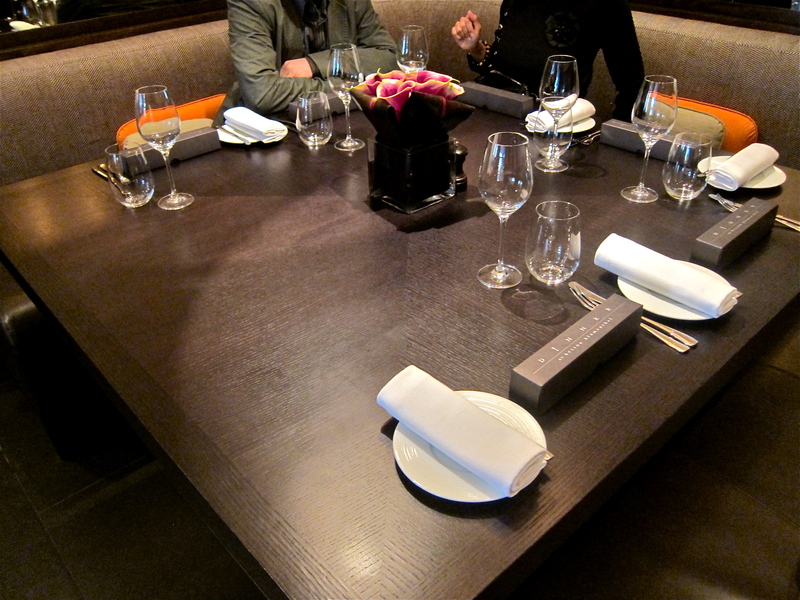 I am happy to be contrarian here as everyone at our table – including me – thought it was pretty excellent. 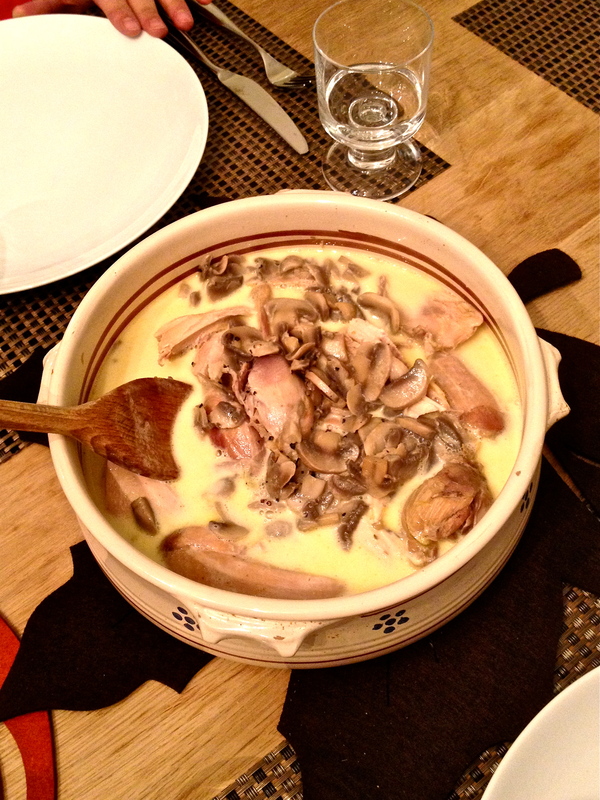 Maybe it was because ours had quail, and I think that the version most people have had contains chicken oysters instead. The quail’s breast was very nicely cooked and went well with the little wobbly discs of bone marrow and the roasted vegetables. 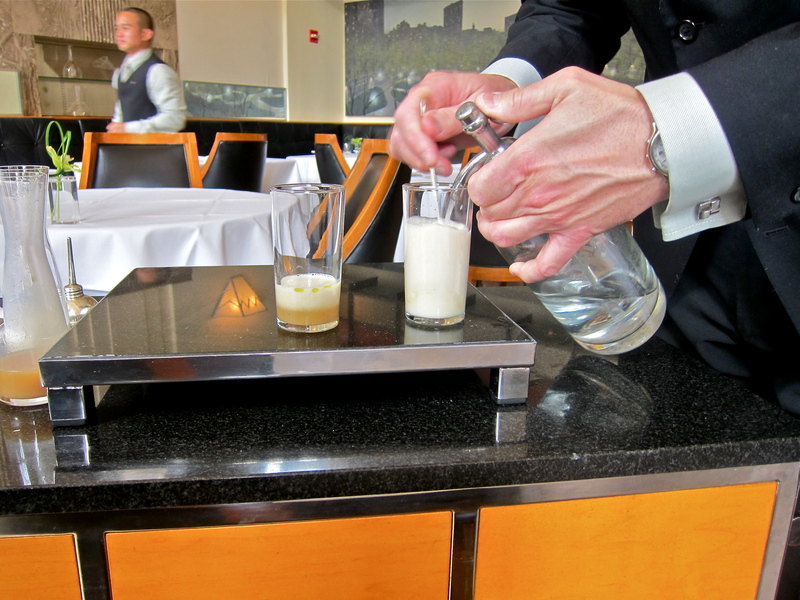 The dish was bound together by a horseradish fluid gel, which was made from milk that had been infused with horseradish and then thickened. Some people have commented about the (lack of) quality of the salad leaves, but they seemed perfectly acceptable to me on this occasion. The plating, as with the first course, did seem a little haphazard, but I guess this was purposeful. 8/10. There were lots of varieties of ketchups swimming around before Mr. Heinz reared his head (there is cockle, cucumber and mushroom ketchup on Dinner’s menu alone), and this was the historical element in the turbot dish. 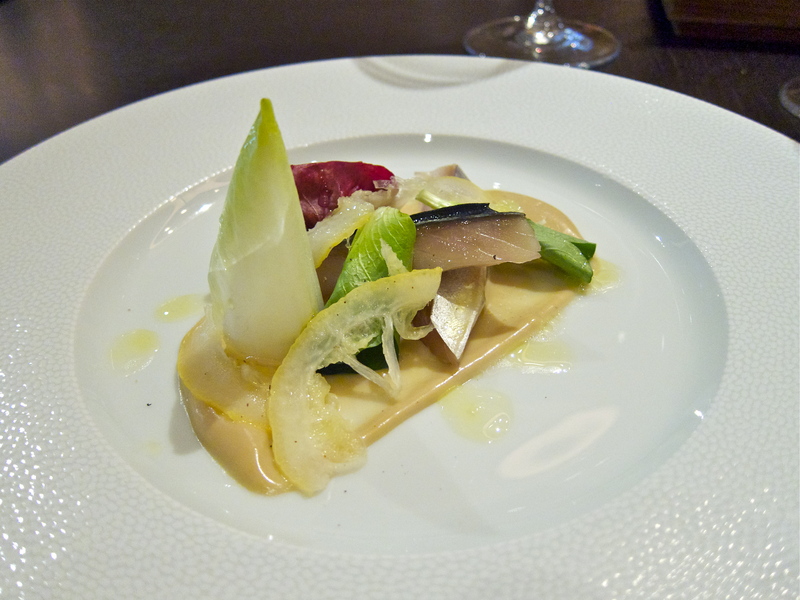 Besides the fish, there were baby chicory leaves which were quite bitter and some cockle ketchup which was meant to offset the astringency; the ketchup was made from thickened mussel stock, combined with fresh cockles, capers, gherkins, pickled lemons, pickled shallots, herbs and a tiny bit of tartar. 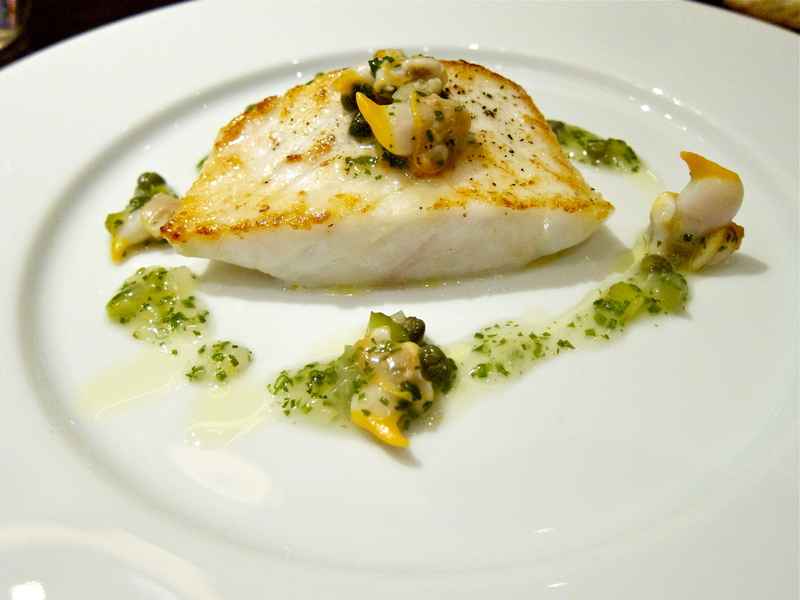 Unfortunately, I don’t think anyone enjoyed the flavors of this dish too much, although the turbot was skilfully cooked. A persistent taste of the sea, which was not particularly pleasant to me, seemed to overwhelm everything else on the plate. Possibly someone else’s cup of ‘t’, but not mine sadly. 5/10. 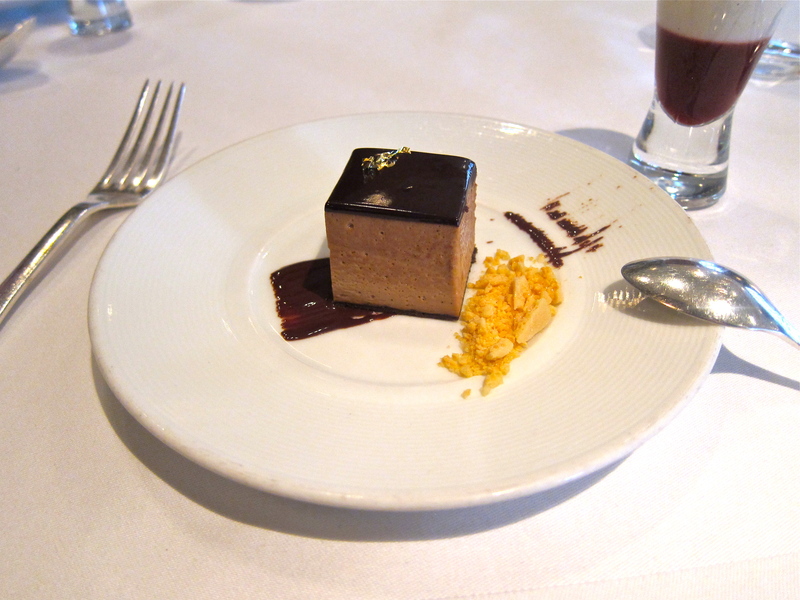 Our palates were soon enjoying themselves again, however, as the next course was one of the favorites of the afternoon. This was one of the best pork chops I have ever tasted. We were only given a few slices each, but the whole chops are very thick and come from the fabled Spanish Pata Negra pigs which have excellent marbling that helps to create a very juicy piece of meat. The crunch from the cabbage and the punchiness from the small amount of the modernized Sauce Robert were the perfect complements for this perfectly simple dish. This was a case of sous-vide cooking working perfectly. The texture wasn’t gummy and it almost felt as if you were eating a fine piece of steak. 10/10. 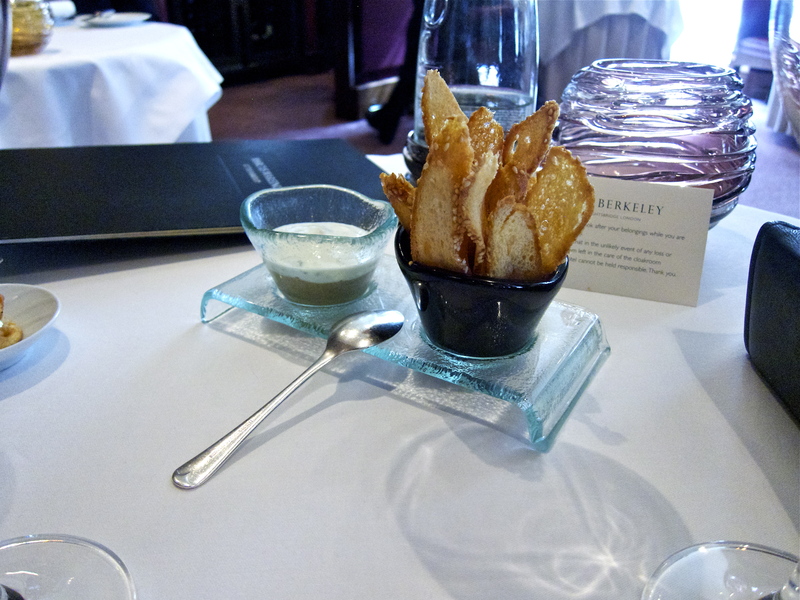 I had forgotten to order some of Heston’s famous triple-cooked chips, but luckily the kitchen had taken care of this without me asking, and was kind enough to bring out a number of little tins of these thick-cut beauties. They were simply divine. 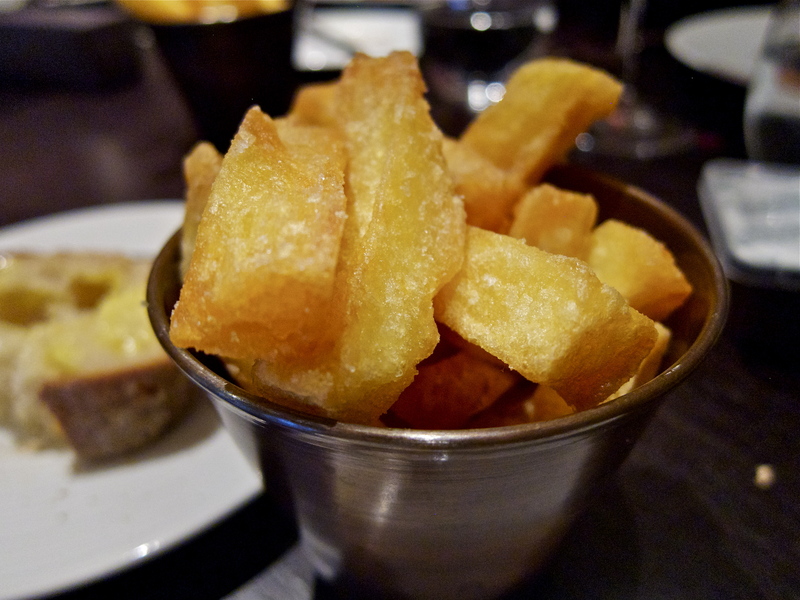 Although I do prefer a thinner frites, it is hard to argue that these are not textbook perfect – so crispy on the outside and so soft and luscious at the core. It was a wonderful bit of starch to go with the last savory dish, which arrived at the same time. 10/10. 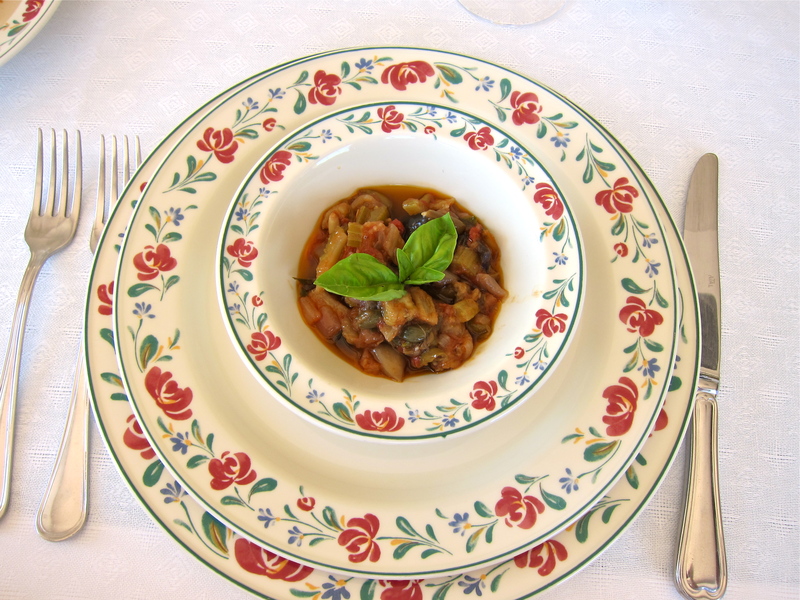 Dale explained that when they were doing their research for the menu, they came across two historic pigeon dishes, one served with ale and one with artichokes. So they decided to combine these. 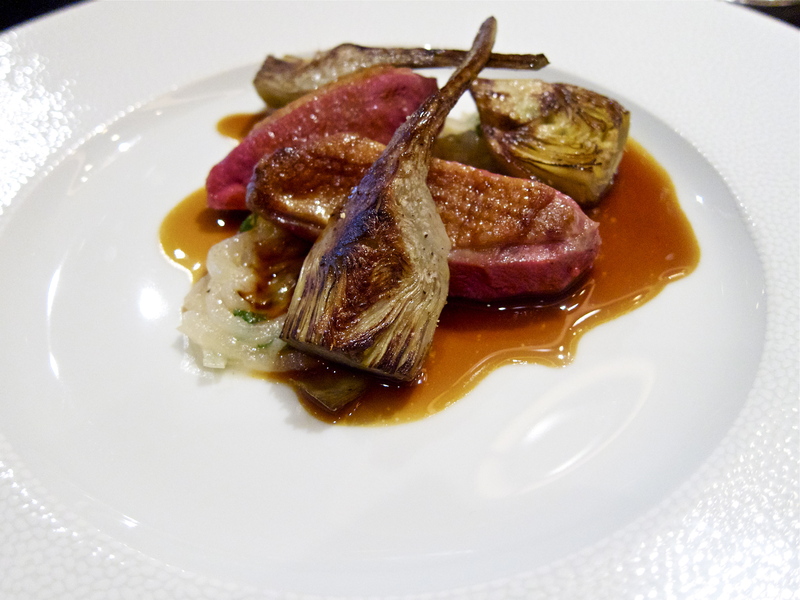 The pigeon breasts had been gently cooked in a water bath at 56° C for 20 minutes, which rendered them nice and tender; however the skin did have some welcome crispy caramelization to it. Amongst the artichokes were also sprinkled a smattering of onions, rocket and thyme, and the pigeon sauce was finished with an organic ale, which was fairly bitter – but this contrasted nicely with the sweetness from the artichokes and onions. Mrs. LF has never to my knowledge enjoyed a pigeon, but she couldn’t stop raving about this one. I had been worried that the sous-vide cooking might make it a very bland dish (I have recently had meals at very accomplished restaurants where this method took the enjoyment out of the main meat courses) but it again worked well in this instance and made for a thoroughly enjoyable and memorable dish. 10/10. 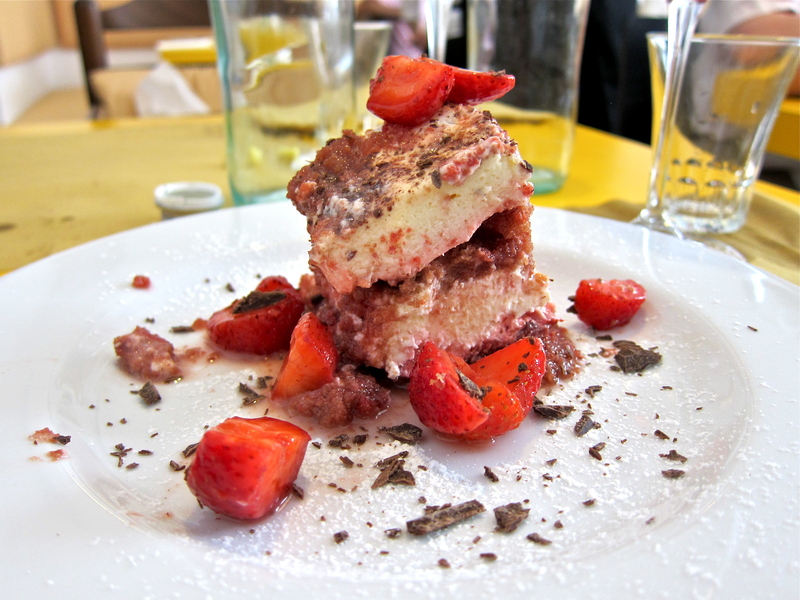 The first of the sweeter dishes was upon us, and there was a bit of controversy here. Most people didn’t care for it too much, but more interestingly, all of us could swear that we tasted beetroot somewhere in the dessert. Not that this was a bad thing, but the kitchen confirmed that this was definitely not the case. We were stumped. 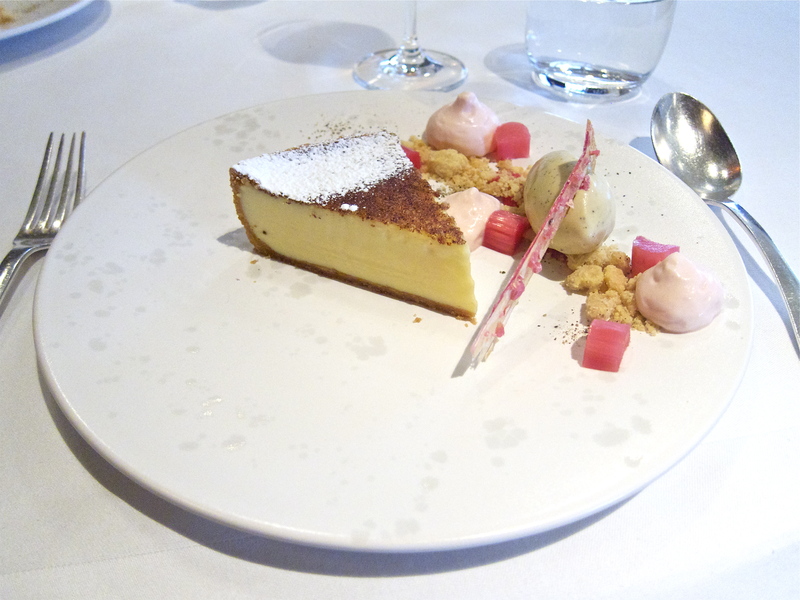 So far as I could tell, it was composed of a rhubarb sorbet with fromage blanc and rosehip jam beneath it, plus a (possibly raspberry) tuile. 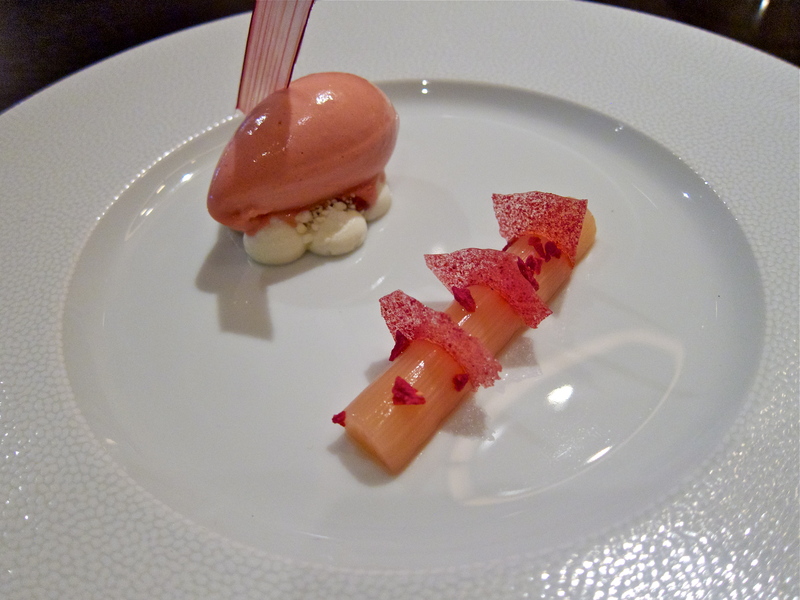 The beautifully presented stalk of rhubarb on the side had been soaked in Campari and was nice enough. 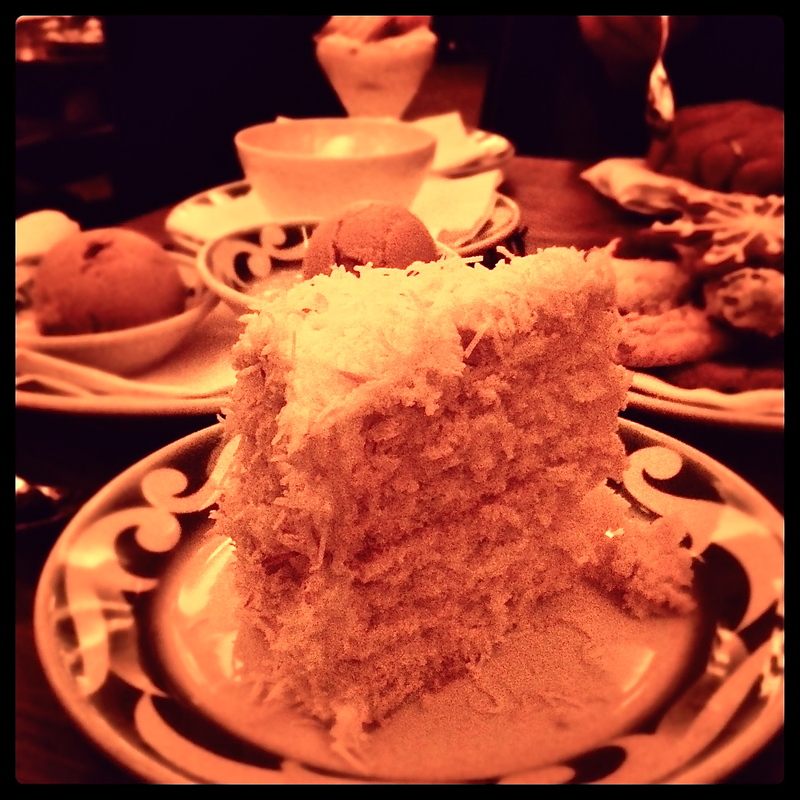 It was a fresh and pleasant dessert but the taste of it certainly didn’t wow me. 5/10. I decided to have a closer look at the craziness of the pineapple grilling apparatus, and got a few pictures of the glazing process. It may be gimmicky, but it is a pretty classy gimmick if you ask me. Luckily, I got to taste the fruits (literally) of the poor pineapple glazer’s labor a little while later. 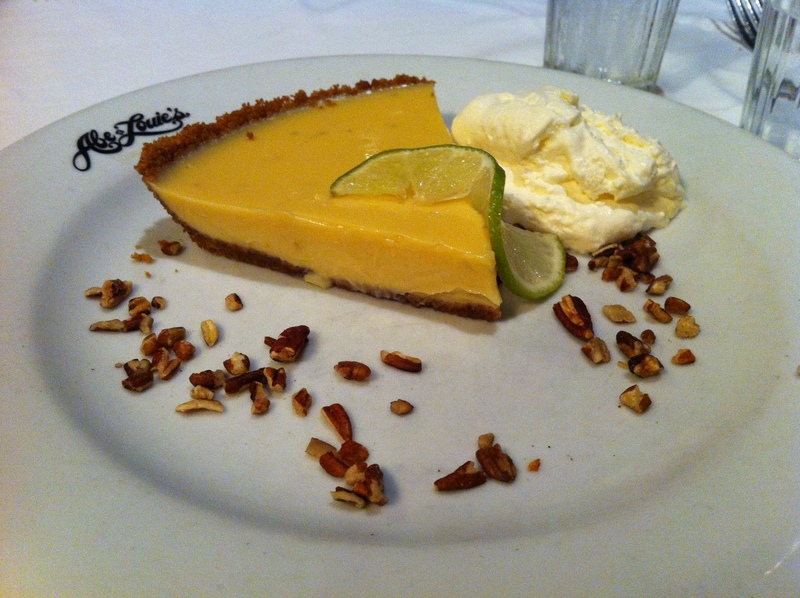 This was without a doubt my favorite of the desserts we sampled. 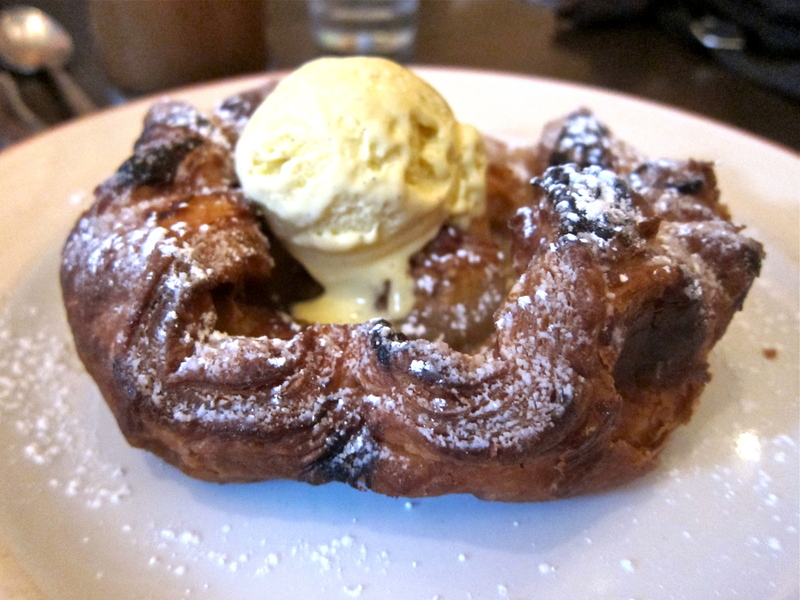 The brioche cake was soaked in the most luscious mix of sugar and brandy (and quite a bit of brandy, hence the name). 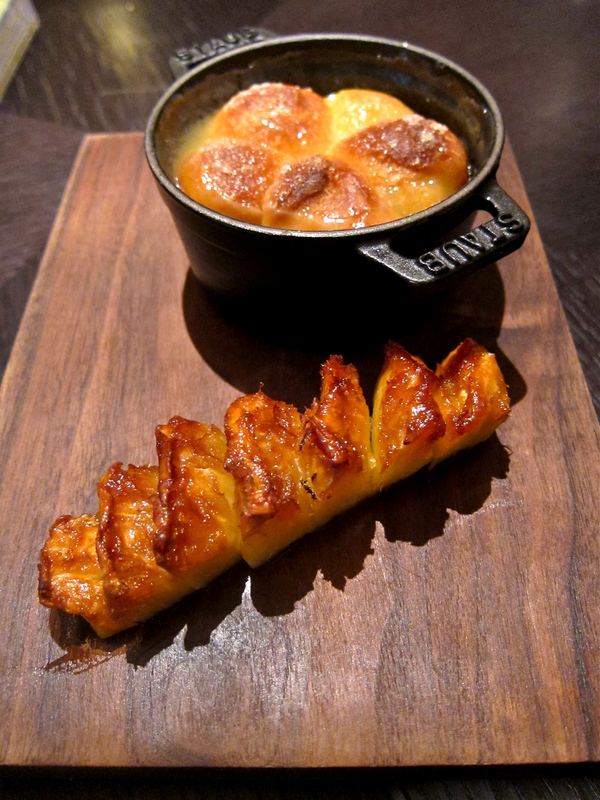 I can never get very excited about bread and butter pudding – although it is one of Mrs. LF’s favorite things – but I would definitely look forward to eating this most nights. The effect of the rotating roasting on the pineapple was perfect as it had been cooked evenly through and was nicely caramelized on the edges. I thought it was a marriage made in heaven. 9/10. We had eaten what I believe was pretty much the same dessert at the Fat Duck a while back, and I remember writing that besides being one of the most beautiful desserts I had ever come across, it was also truly delicious. I don’t know if my taste buds have moved on or what, but I just didn’t enjoy it this time around. The dessert divided opinions around the table, as had a few of the earlier courses, and I was very let down as this was one of things I was most looking forward to. It still looked very pretty, though instead of being rectangular it was now triangular, reminiscent of the poshest slice of pie you might ever see. It consisted of caramelized puff pastry, and from the bottom up there was a caramel jelly, then caramelized apple, then fromage blanc with rosewater. 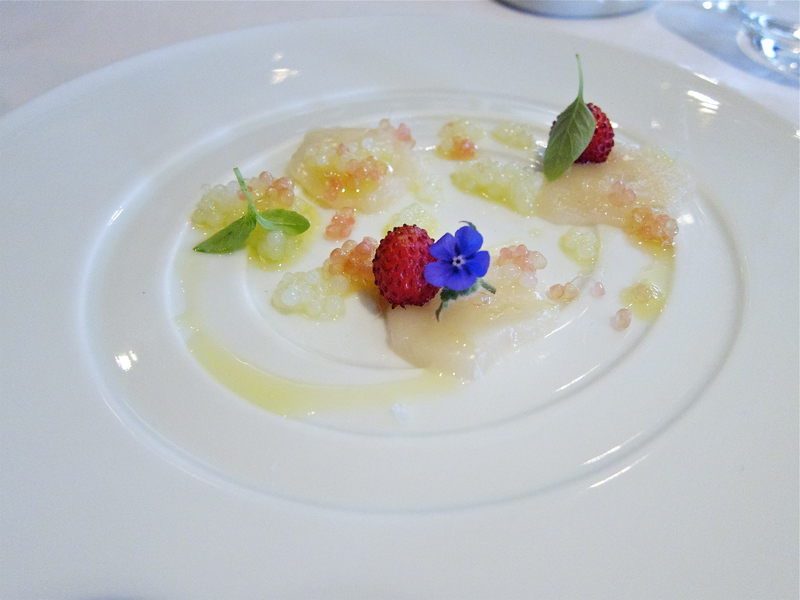 Beside the blackcurrant sorbet were some crystalized rose petals, fennel seeds, apple fluid gel and some actual fennel. 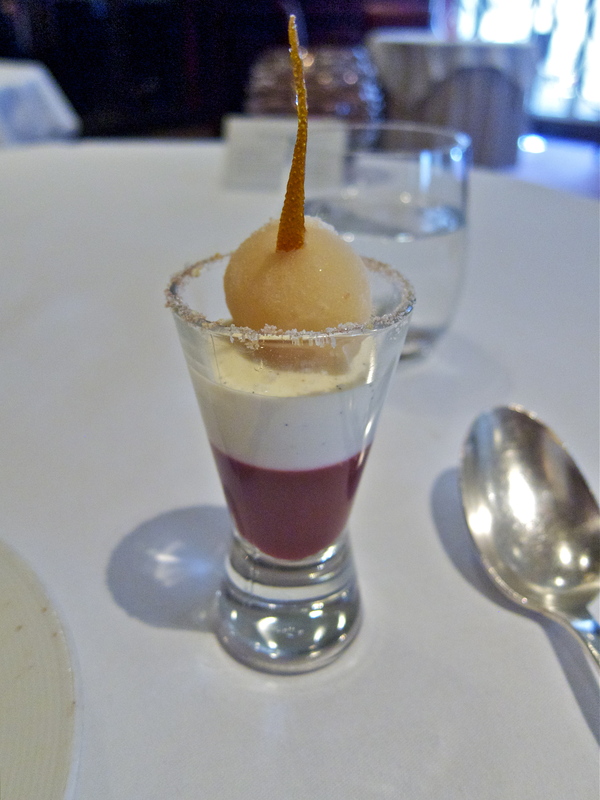 To me the sorbet was too strong and the lovely apple flavor I remember from the Fat Duck version seemed to be absent this time around. 5/10. 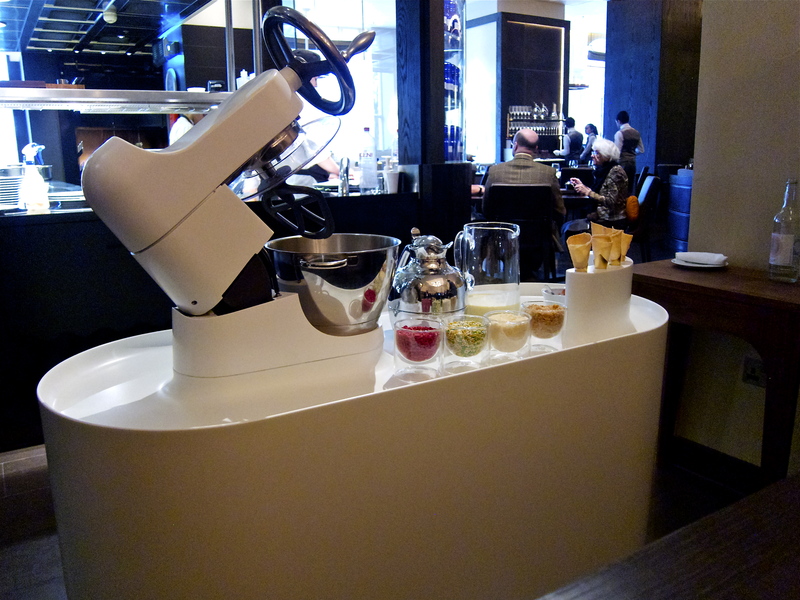 I am not quite sure how the white futuristic ice-cream trolley, from which ice cream is fashioned before you through the use of liquid nitrogen, harkens back to the Halcyon days of British gastronomy, but this is Heston, so you have to give him some leeway, right? 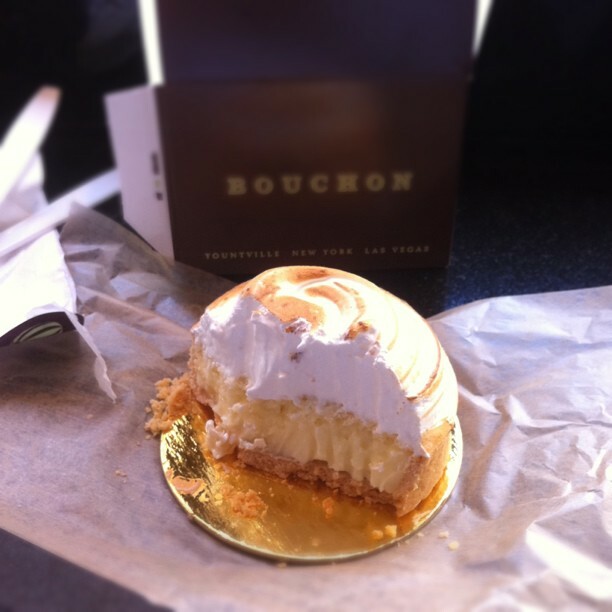 In any case, the pastry chef came out of the kitchen and whipped it up in front of us. They said they were still trying to work out some of the kinks with the machine and this is apparently the reason that they haven’t brought it out to the main dining room yet. They said they wanted to make it look like it could have actually been a mixer of some kind way back when, which I guess they have succeeded in doing, but I am not sure why they made it look like something from the Jetsons instead of something more archaic (like they did with the spit roast, for example). In any case, there was only one option in terms of flavors: vanilla. So we all had this plus any combination of the four toppings we wanted. I chose freeze-dried raspberries, as the above picture can attest. I didn’t particularly like the ice cream itself because it was simply too soft and hadn’t set properly yet (you can also see this from the photo, which was taken right after it was handed to me). 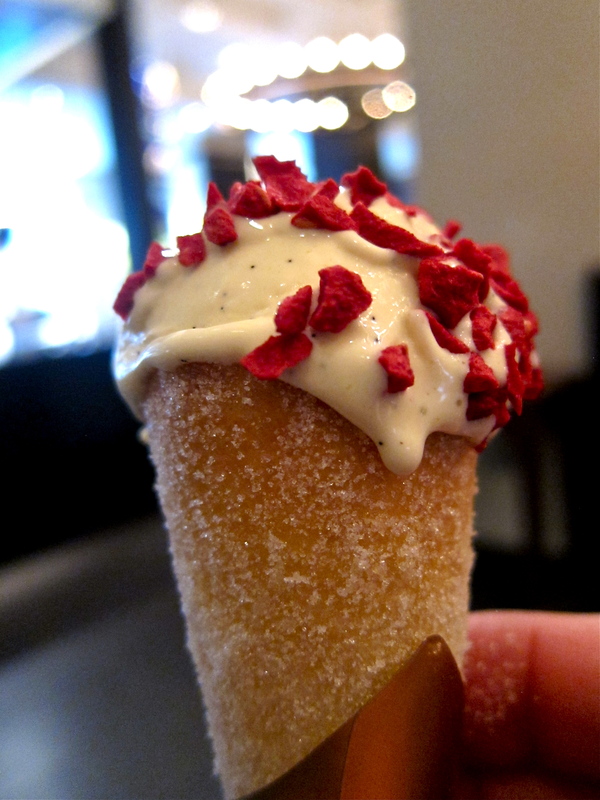 The cone, however, was downright delectable, and was made in-house. After so much of a build up, the ice cream was a bit of a let down. I am sure they will perfect it eventually though. 5/10. 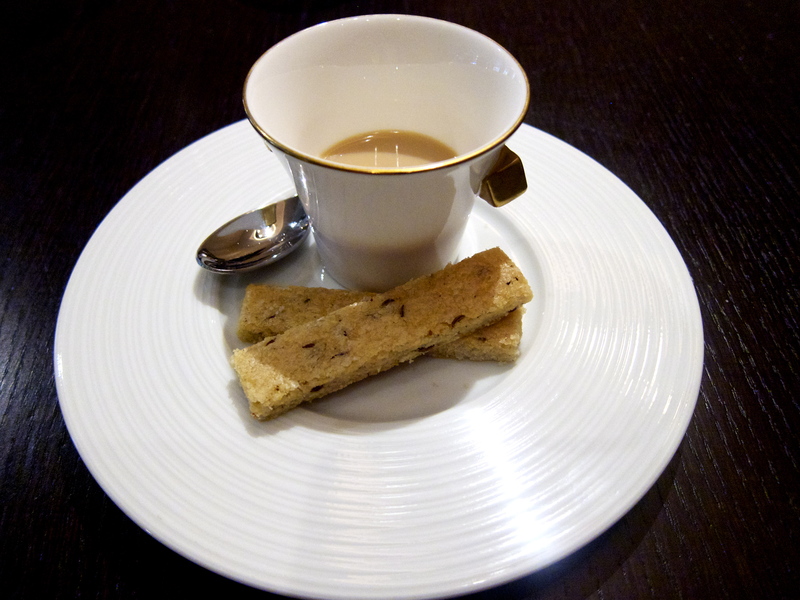 This intensely sweet concoction was served in a little teacup (without a handle) and saucer in a nod to the tea-flavored component of the ganache. I found it slightly awkward to eat and it was also a little too sticky and sweet of an ending for me. The bergamot taste came through well, but it was just too overwhelming for me after all we had eaten. 5/10. I don’t want you to get the wrong idea of my overall feelings about the restaurant from the somewhat mixed thoughts I (and my friends and family) had about the food. 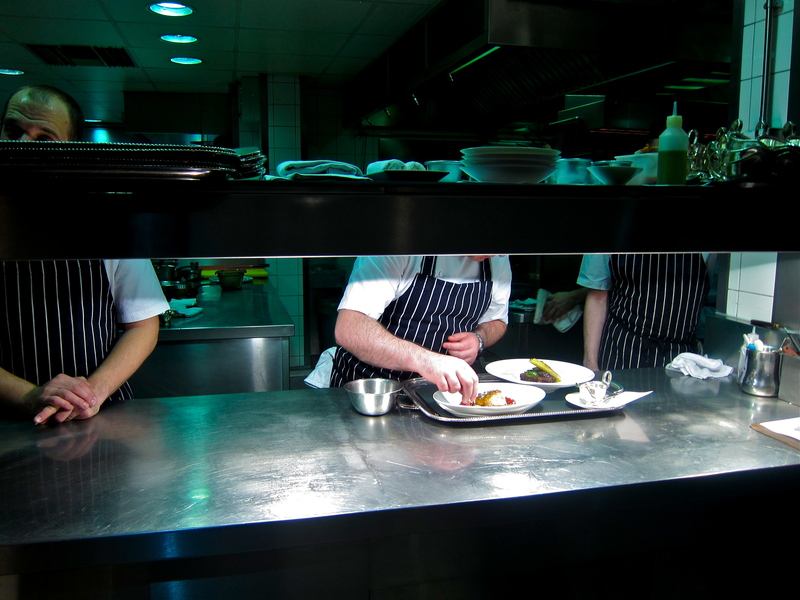 Generally speaking, there is a tremendous amount of technical skill that goes into each dish at Dinner before they even make it to the open kitchen to be finished for serving. There is also a ton of thought put into not only the historical inspirations behind the dishes, but also into the flavour combinations and balance of textures within each plate of food. While it may not be presented as fancily (or fancifully) as it is at the Fat Duck, the technical prowess of the kitchen would be hard to fault. However, this undertaking is at the other end of the spectrum from other new and interesting restaurants in London and elsewhere, which tend to focus on the quality of the produce itself and attempt to let the natural ingredients speak for themselves to different extents. These establishments do not employ the technical wizardry (or the 45 or so chefs) that Dinner does. This doesn’t make one better or worse than the other, as the enterprises have very different philosophies and aims, but it does make it a very different experience. Our own experience at Dinner was overall a very positive one. 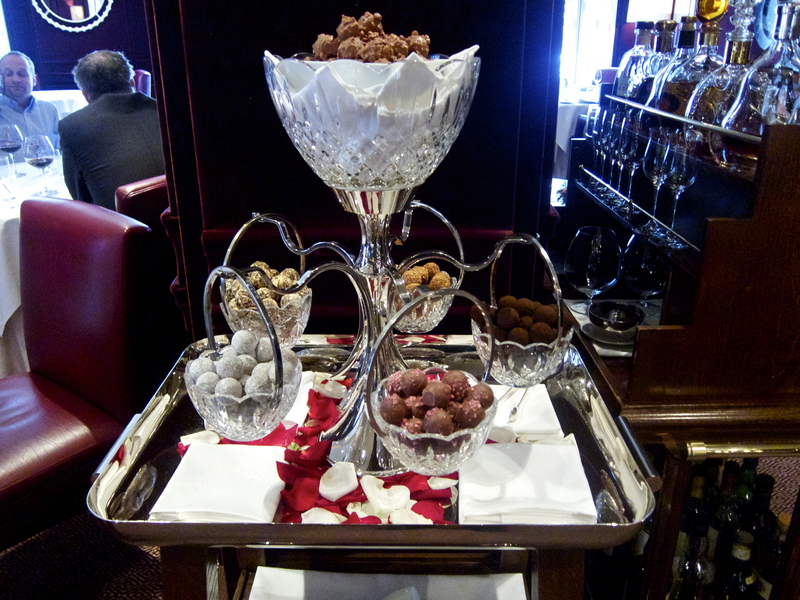 From the moment we were greeted and seated at our table, we were exceedingly well looked after. (The only instance where this didn’t happen was right toward the end as service was winding down, where things seemed to lag a little bit). Mathilde (@mathildecuisine), who joined us for the meal, was observing Lent at the time and they catered to her needs well from what I could see. Being Mathilde, when Mrs. LF asked the kitchen for some yogurt for Baby LF, she also asked for some too. Yes, this is the same woman who asked for hot chocolate at noma when only tea and coffee were offered :). As with the Danish hot chocolate she received then, she was very impressed by the quality of the simple offering of yogurt at Dinner. 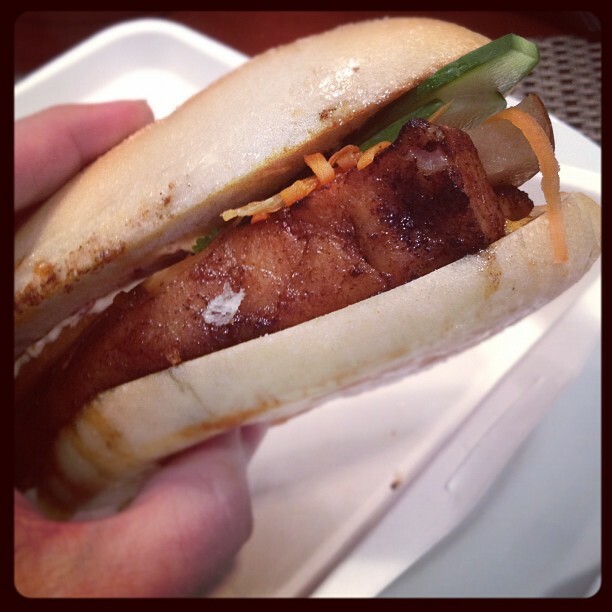 I generally enjoyed the food, but the lows and highs seemed to be more exaggerated that I had expected they might be. 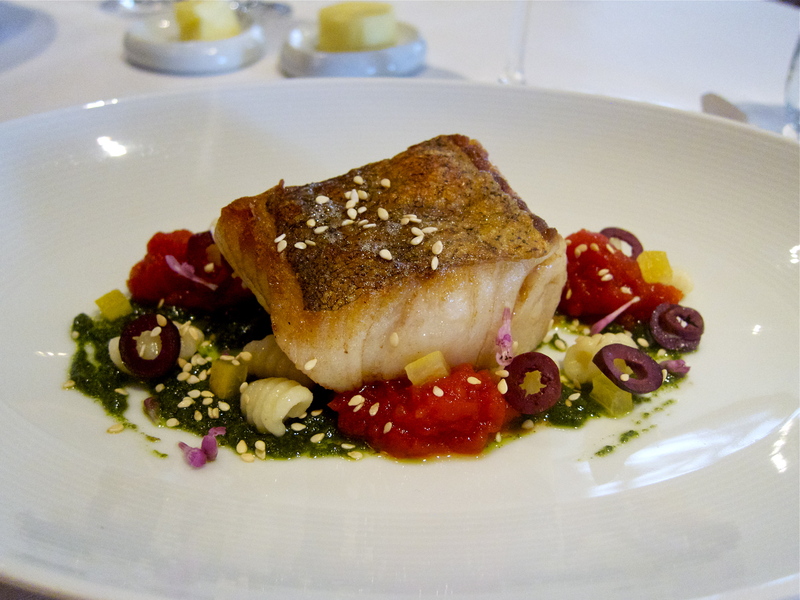 I suppose the only dishes I didn’t really enjoy were the roasted turbot and the Taffety Tart. Although a few of the other dishes didn’t stimulate my taste buds all that much, the pork, pigeon and tipsy cake were pretty amazing in their own right. I didn’t feel like a lot of things were all that new at Dinner (though their descriptors may try to convince you otherwise with their historical verbiage) but I did think a lot of things were excellent. And they made us feel very comfortable. We had a lovely long lunch, with Hyde Park as our backdrop, and got to catch up with old friends in a splendid setting. And you can’t really complain too much about that. Wine: the list is comprehensive (as you would expect) but the mark-ups can be stiff, and seemed to average about three times what it would cost you in a retail shop. 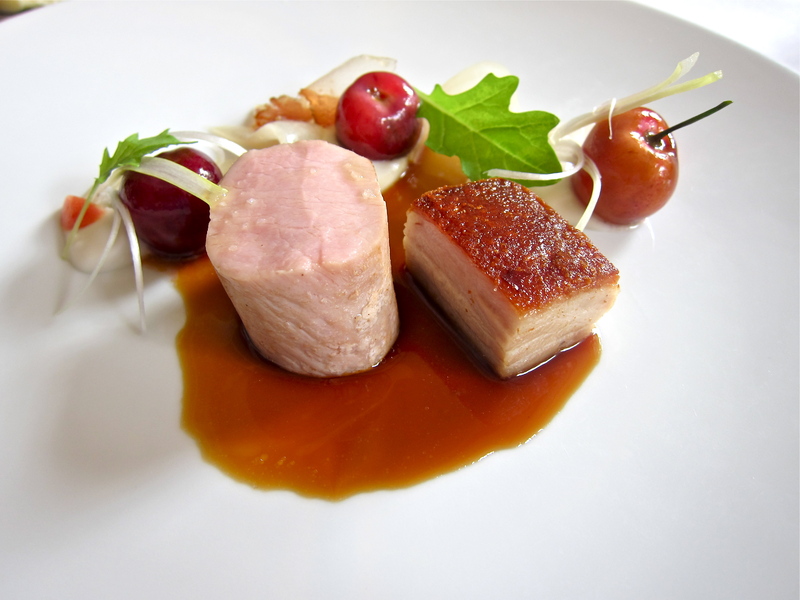 For example, this other breed of restaurants – call it the ‘new naturals’ or what you will – also focus heavily on seasonality and availability of local ingredients, whereas I could envisage the menu at Dinner could remain more or less the same throughout much of the year, serving what it wants to serve, rather than what is abundant and fresh during each season. This is not a criticism so much as an observation. One thing I think they should watch out for is not to fall into the same trappings of the Fat Duck with regards to the menu remaining fairly static over time. As this is a larger restaurant and people will be able to return more easily than at the Fat Duck, they need to mix things up to keep it interesting for diners. I would also humbly suggest that they try to at least acknowledge the changing of the seasons when introducing new menu items.